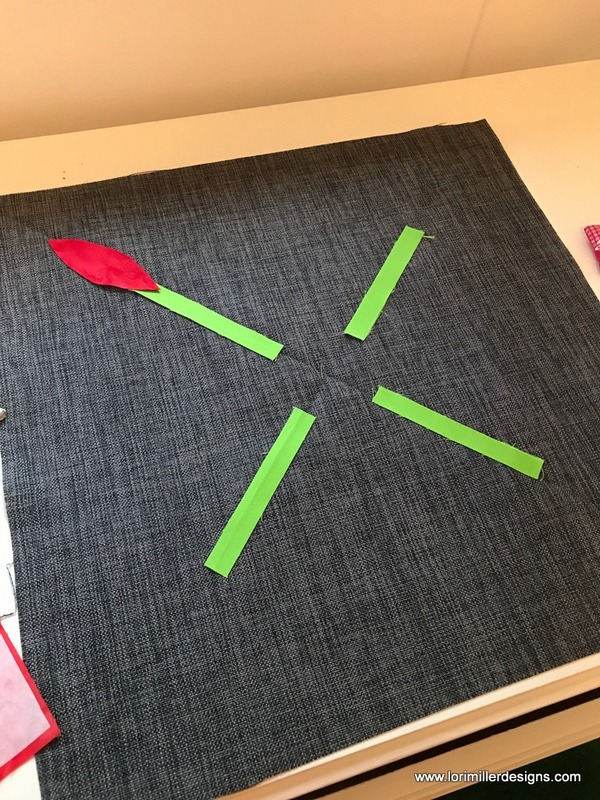 Here is a super easy to make table runner and matching napkins to celebrate St. Patrick’s day. 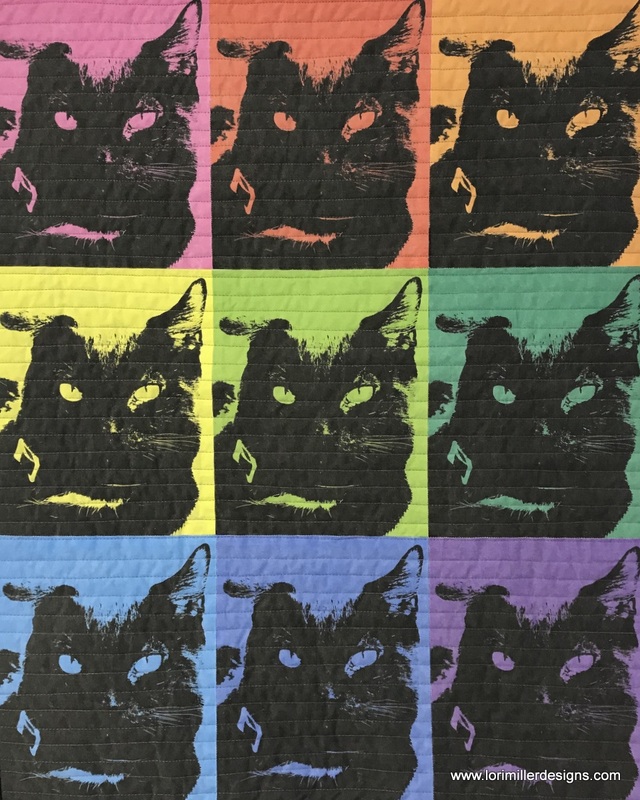 This easy project can be made in any fun novelty fabric. Grab 1 ½ yards of a St Patrick’s day print and stitch this up in time for your corned beef and cabbage dinner. This is a great practical gift idea and a perfect beginner’s project! 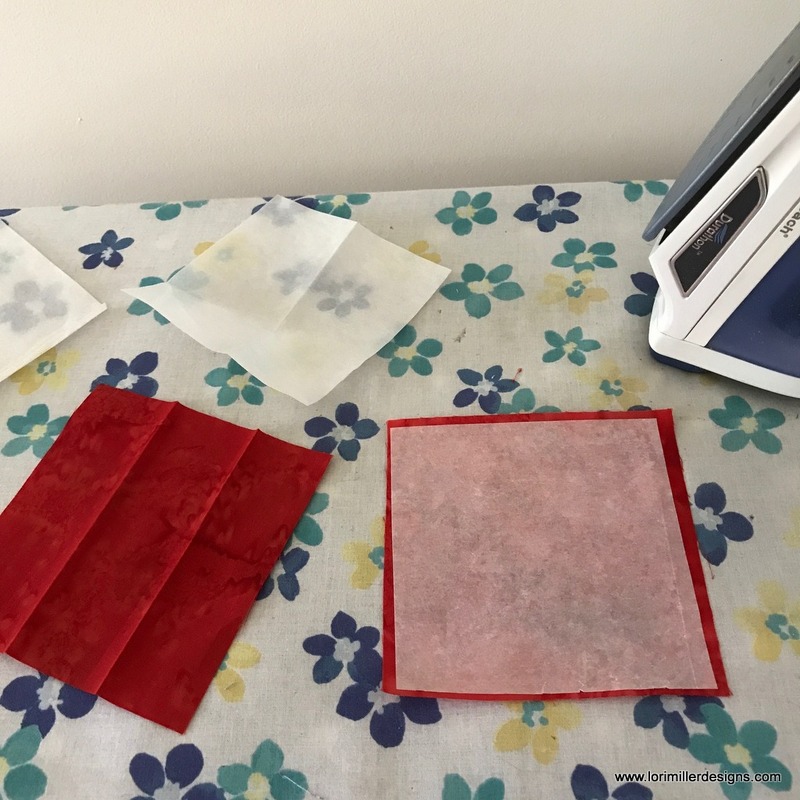 You will learn to sew a simple hem and stitch straight lines for the table runner and 4 napkins. Prewash and dry the fabric. I threw mine in the washer on warm with a smidgen of detergent and dried it in the dryer. This will help to pre-shrink the fabric before you sew it together and I think it washes better after use. 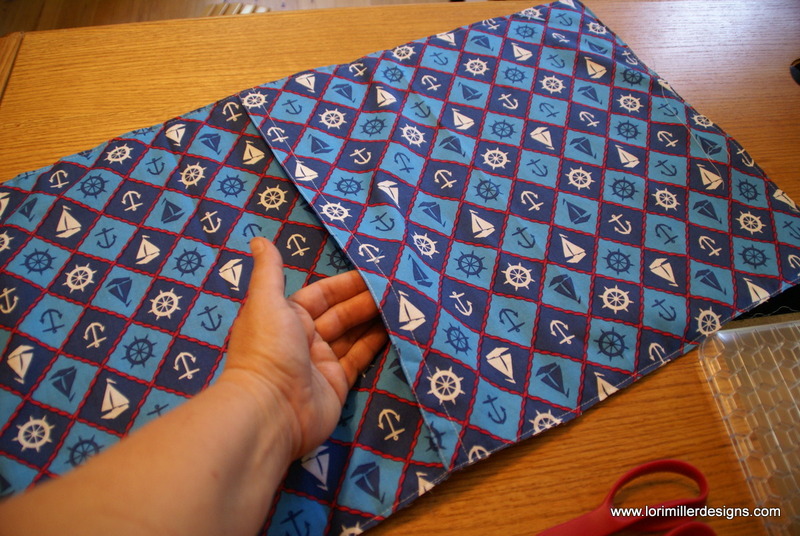 Next, iron any wrinkles out of the fabric so that it will lay flat to cut out your pieces. There is a selvage on each side of the fabric which needs to be cut off. Evenly trim the selvages off the sides. I usually take ½ to 1 inch off to get all of the selvage. Cut the table runner 16 inches wide and the length of the fabric(approximately 54 inches). For the napkins, cut 4 squares 13 x 13 inches. 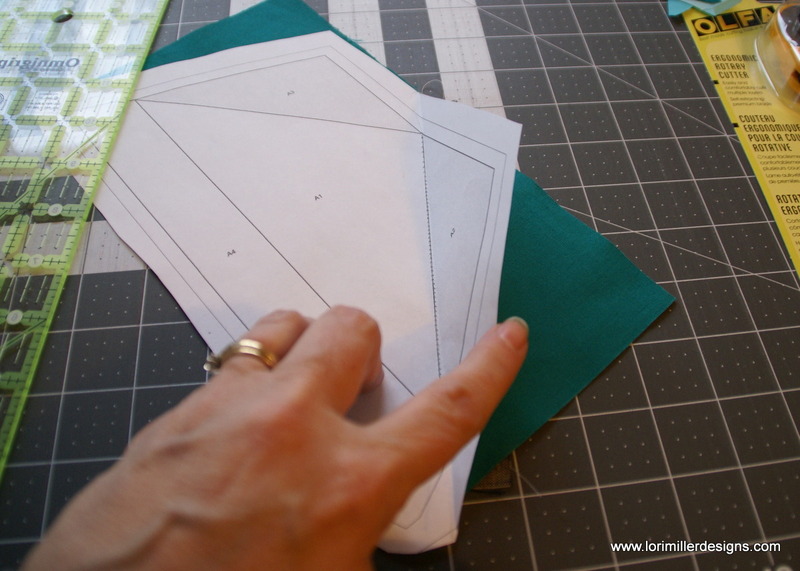 Fold the material over, wrong sides together ½ inch. 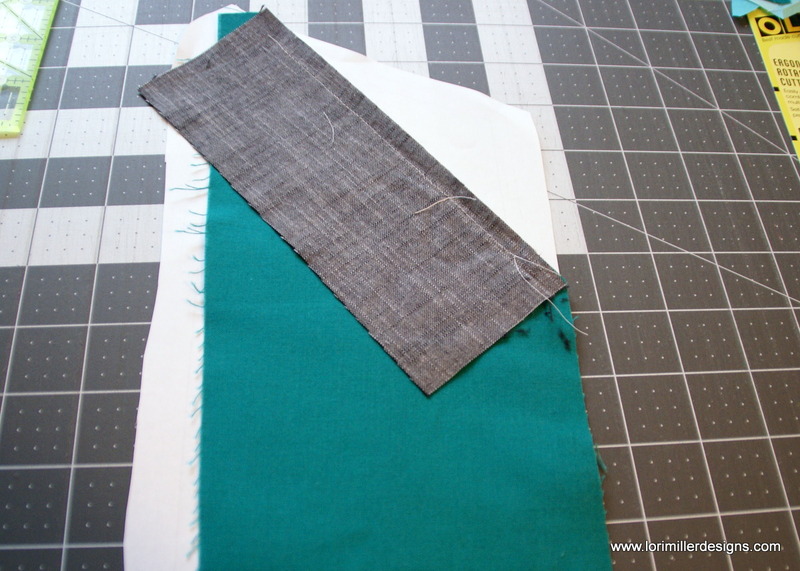 Then fold it over ½ inch again to fold the raw edge into the inside of the fabric. Pin the hem in place. Place your presser foot about 1/8 inch from the edge of the fabric and carefully stitch down the hem. 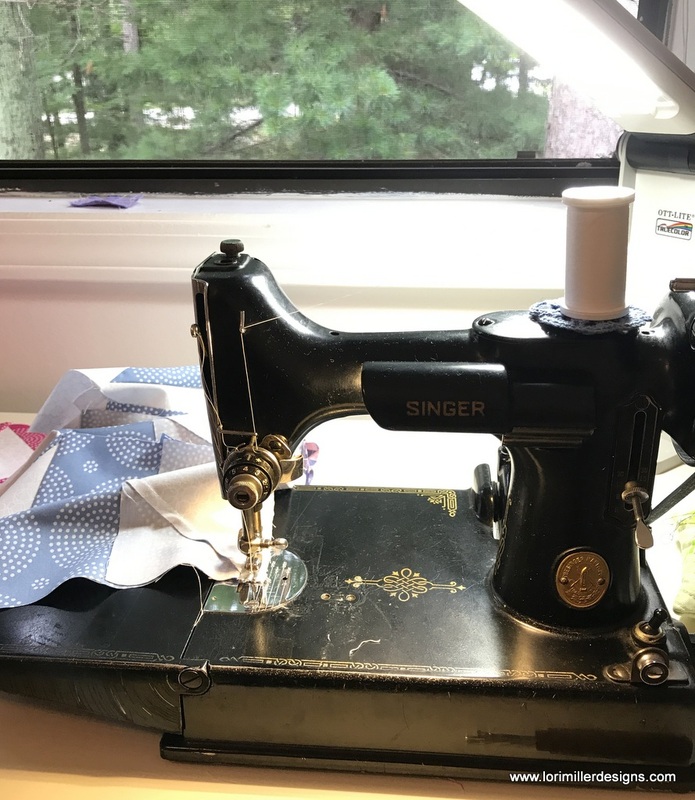 Topstitch the hem with your sewing machine. Sew as straight as you can. I used a stitch length of 2.5mm. I use my hands like this to guide the fabric to keep the edge of the hem next to the presser foot. Pull the pins out as you go so you don’t have to stitch over them. Trim your threads. 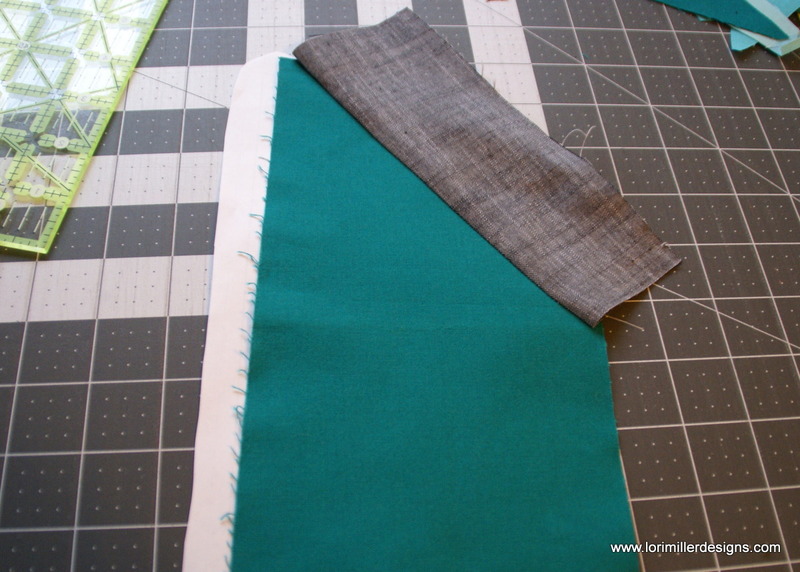 Now, sew a ½ inch double hem on the long sides of the table runner. 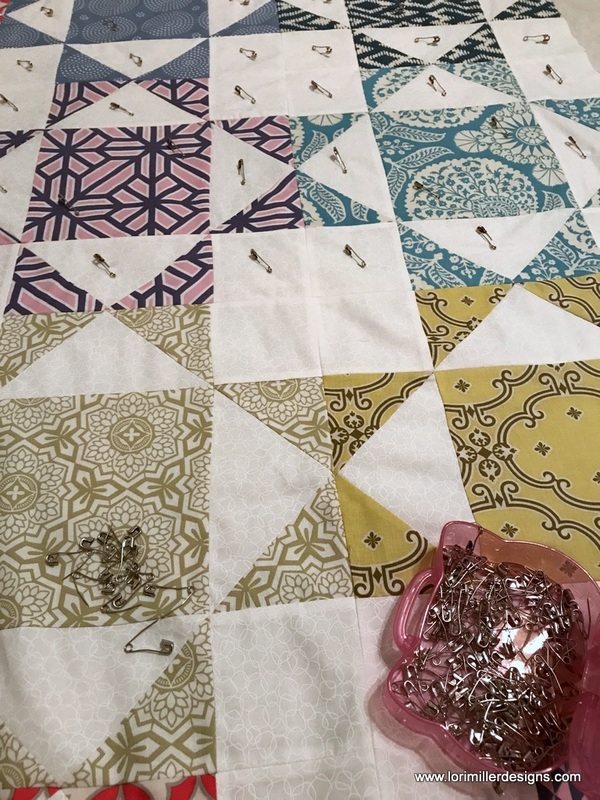 Follow the same steps as you did for the ends of the table runner, only this time you will be pinning the long sides to sew. On these ends, backstitch 2-3 stitches when you start and end the sides to secure the thread. Top stitch again around the entire table runner stitching 1/8 inch away from your initial stitch line towards the outside of the table runner. When you get to the corner, take two stitches past the intersecting stitch line and turn. If your stitch length is 2.5 mm, it should be about the right position away from you original line again. Stitch all the way around. Trim your threads. 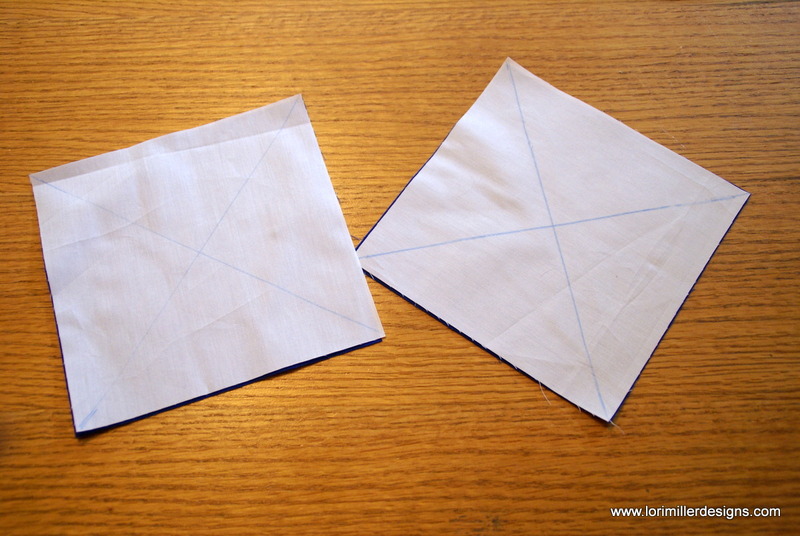 Now that you have mastered the double hem, you get to try a smaller double hem on the napkins. Fold the material over, wrong sides together 1/4 inch. Then fold it over 1/4 inch again to fold the raw edge into the inside of the fabric. Pin the hem in place. Place your presser foot so that you are stitching right down the middle of your folded hem. 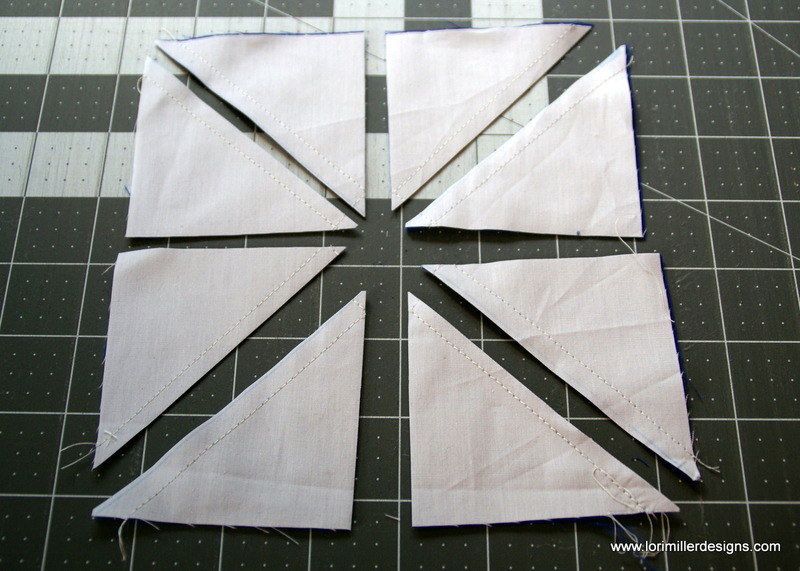 Now, finish by sewing a 1/4 inch double hem on the remaining sides of the napkins. Follow the same steps as you did for the first two sides. On these ends, backstitch 2-3 stitches when you start and end the sides to secure the thread. Trim your threads. Fold the napkin in half and then in half again and iron. Finish the hems on the remaining napkins. That is it, you have created a beautiful table runner and napkins all by yourself! You will have some fabric left over, you may be able to make additional napkins or save it in your stash for another project. Variations: Use any holiday print or just a fun fabric design to create your table runners and napkins. Mix and match coordinating fabric for the table runner and napkins. 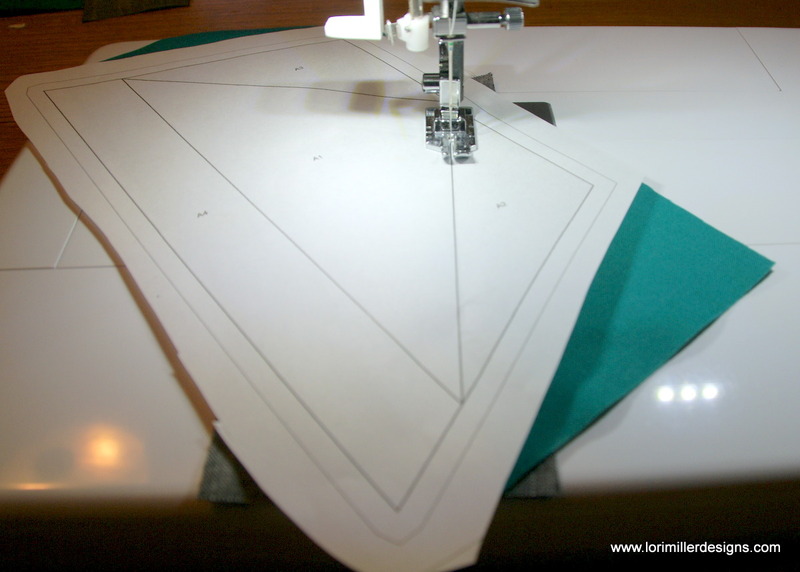 Play with some decorative stitches on your sewing machine instead of just sewing a straight line for your hems. Have some fun and see what you can create. Ahoy! 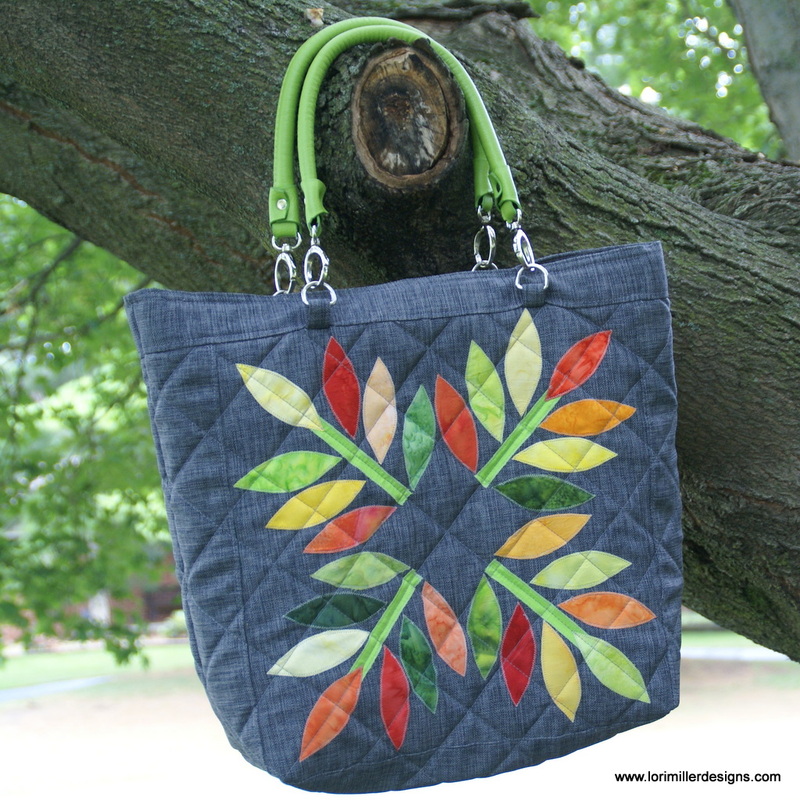 It is summer and that means sewing projects that are fun, easy and quick to stitch up. That leaves you plenty of time to soak up the sun and play in the outdoors. 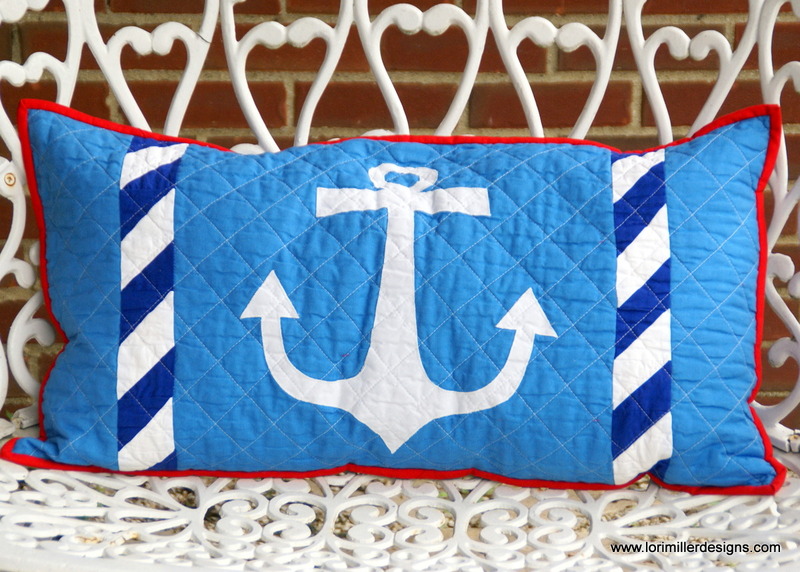 This nautical themed pillow is designed to sit on an outdoor bench or decorate a bench in your home. 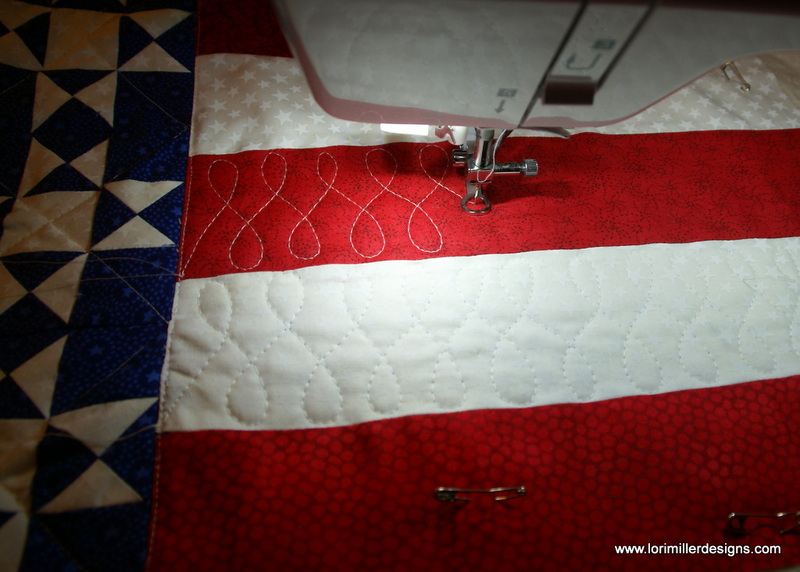 It was designed with Electric Quilt 8 using a Horizontal Strip quilt layout. 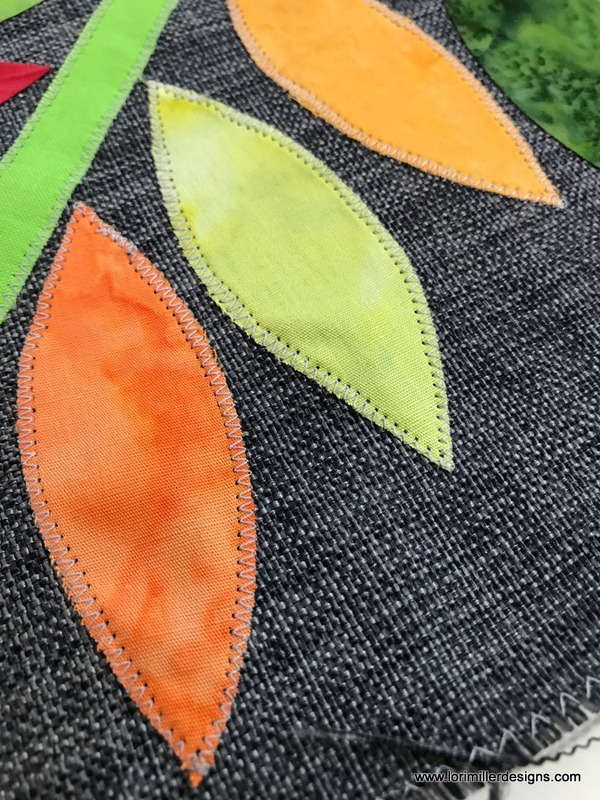 With some very easy shortcut piecing and machine applique, you can make this pillow up in an afternoon. Enjoy! Make the half square triangles to resemble a rope design. 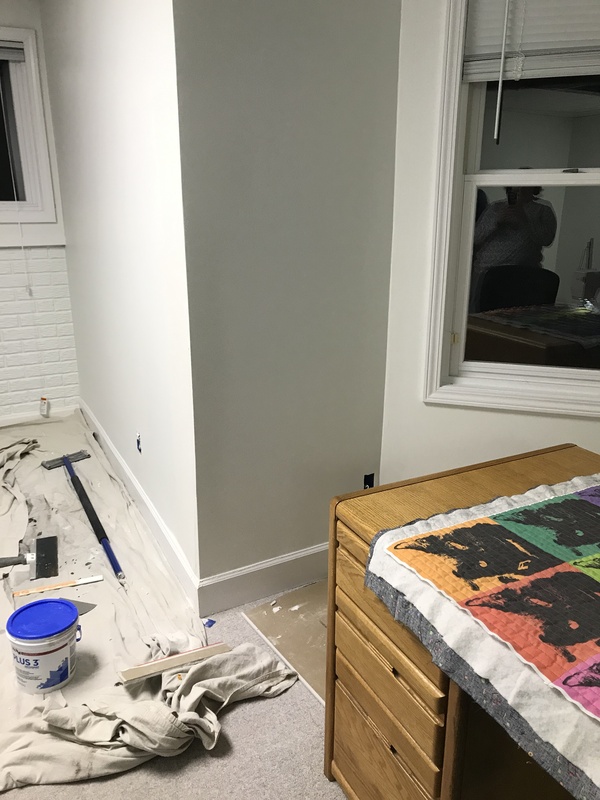 Take the two white 6″ squares and mark them from corner to corner. 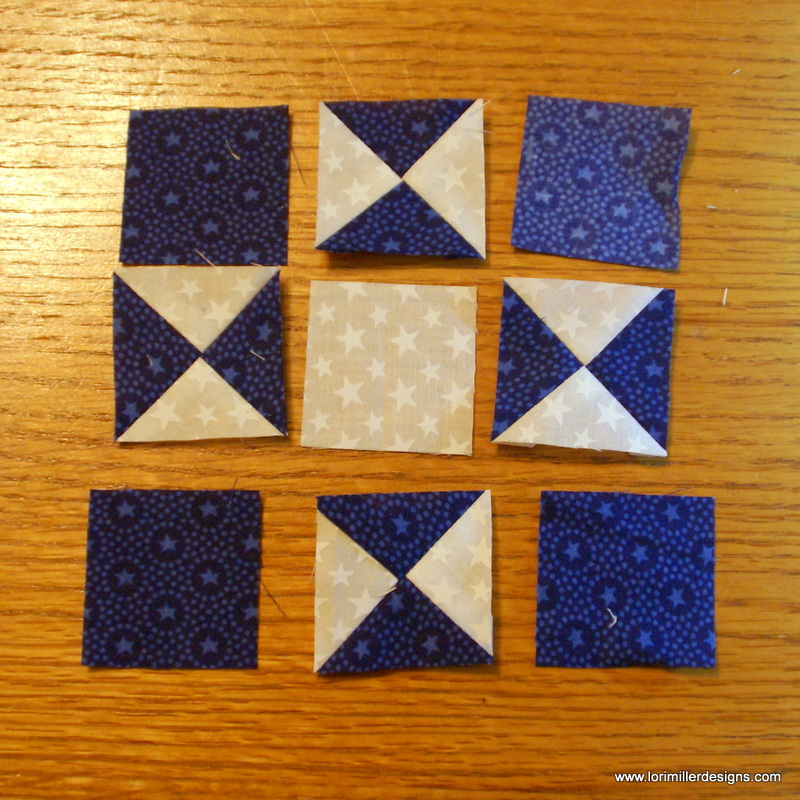 Place the white square right sides together with the navy blue 6″ squares. 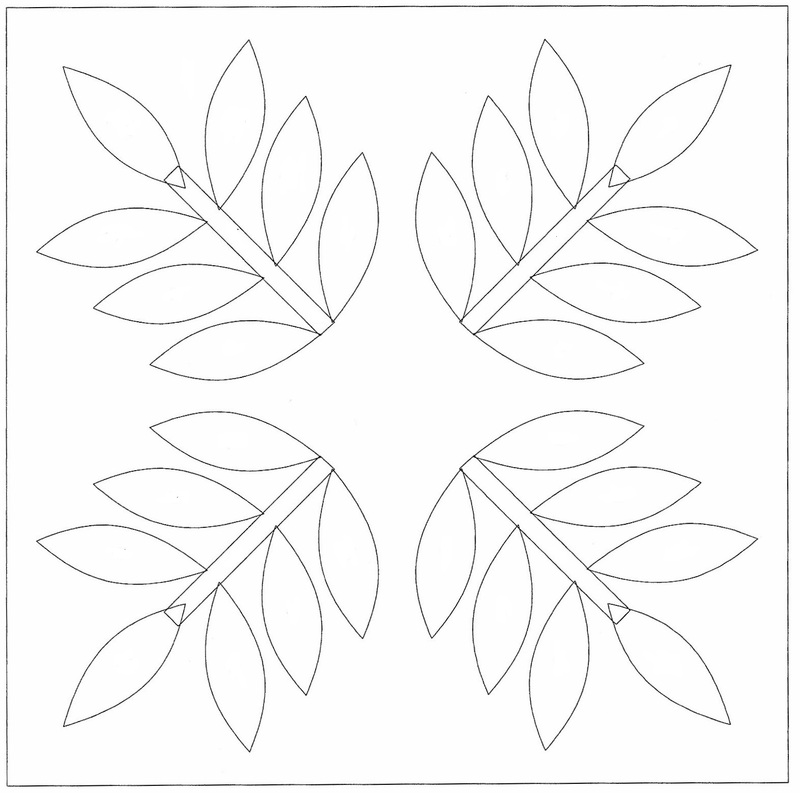 Stitch 1/4″ away from each side of the diagonal marked lines. 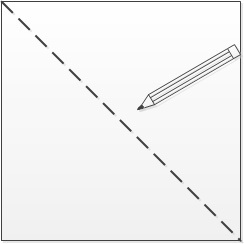 Carefully cut the squares on the diagonal lines and then in half both ways as in diagram above. 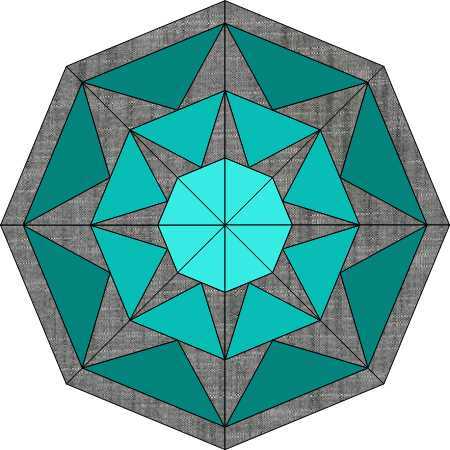 This will create 8 half square triangles for each square for a total of 16. Press the seams to the darker fabric. Trim the blocks to 2 1/2″ square. Stitch the half square triangles together in groups of two to start, then piece them all together to form the rope strips. I stitched both in the same directions. Set aside. 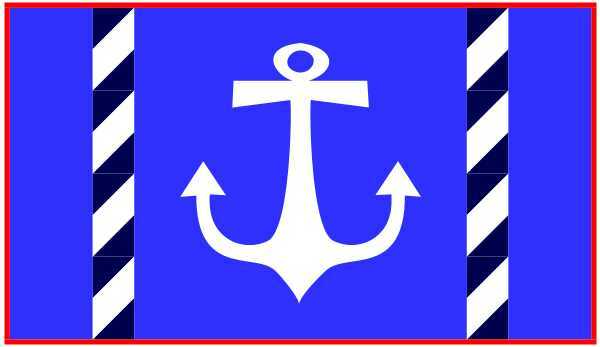 Next, print out the anchor template and tape it together using the guidelines. 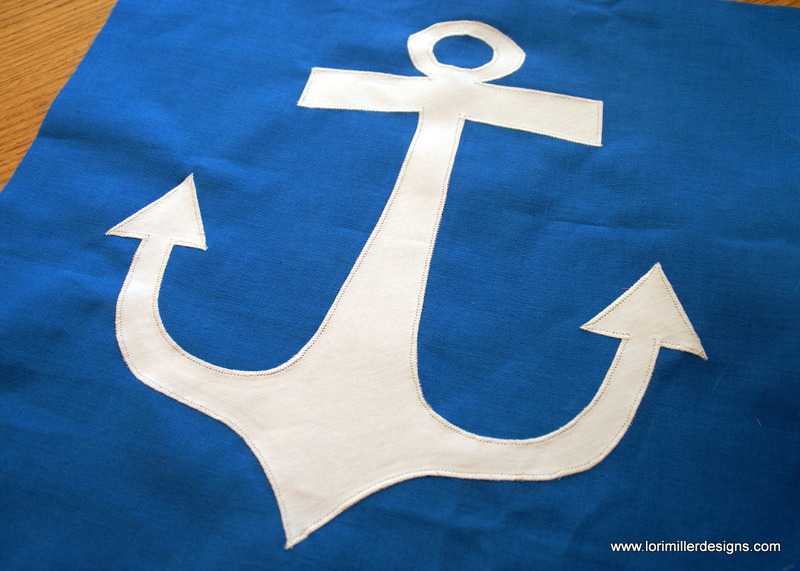 Using a light box or a window, trace the anchor outline to one side of the fusible web. Press the fusible web according to the manufacturers instructions to the wrong side of the white fabric 16″ square. 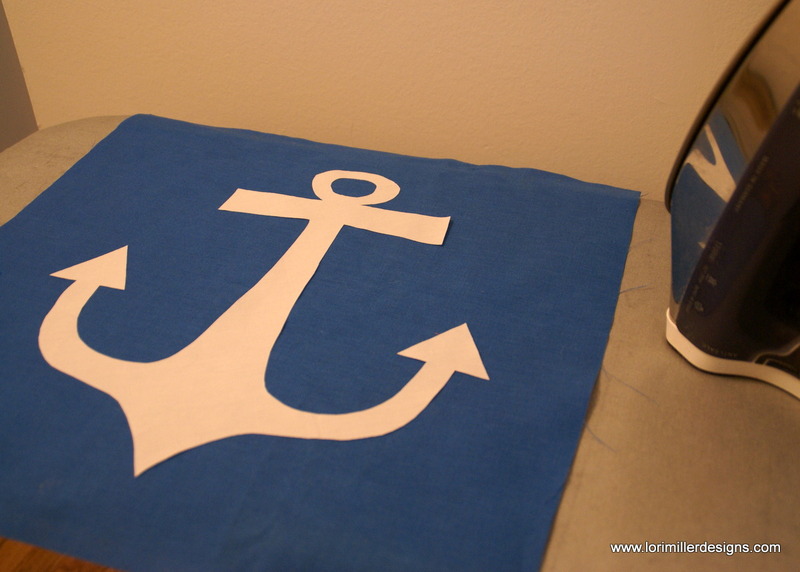 Carefully cut out your anchor applique. Peel off any backing. 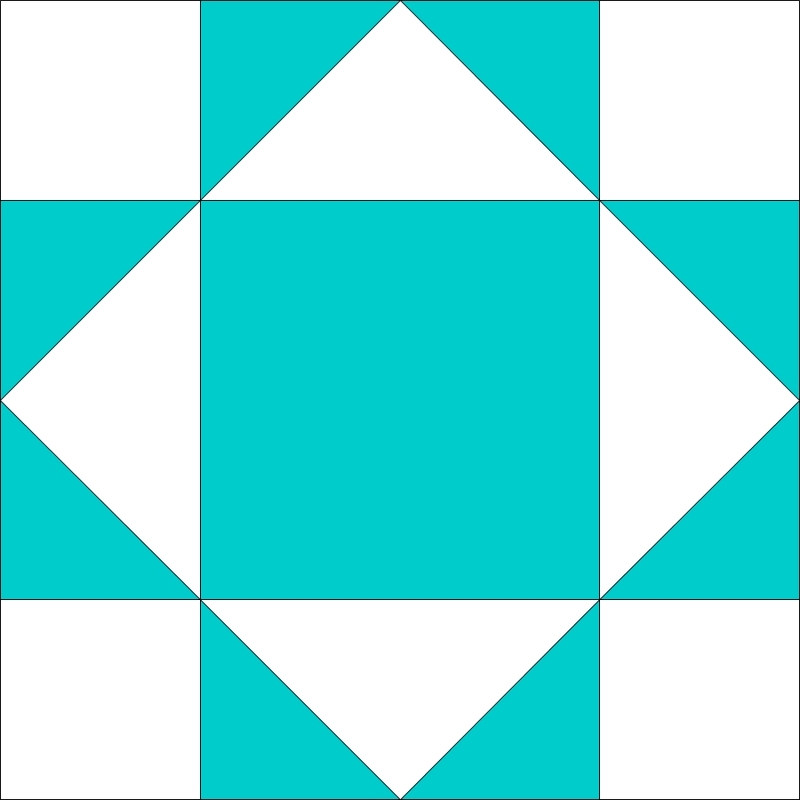 Position the anchor in the center of the 16 1/2″ light blue square. One you have it where you like it, press the anchor onto the center of the pillow. 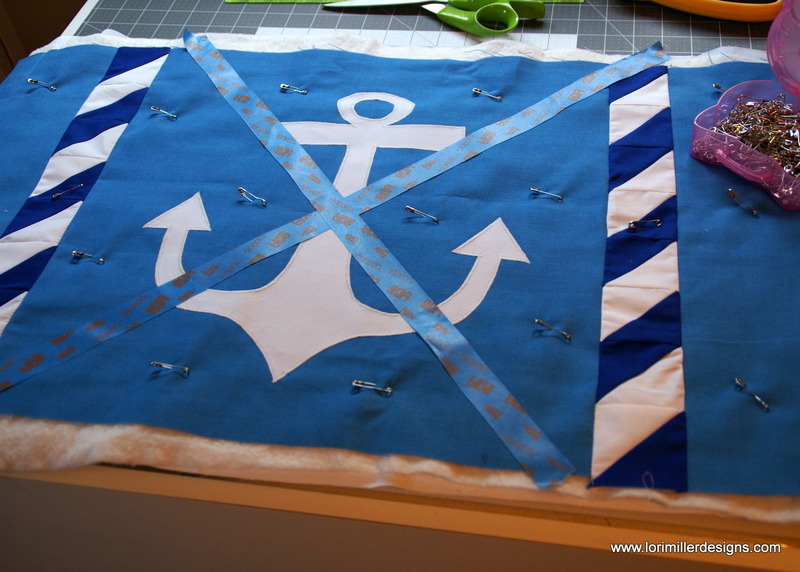 Now applique around the outside edge of your anchor to finish the applique. 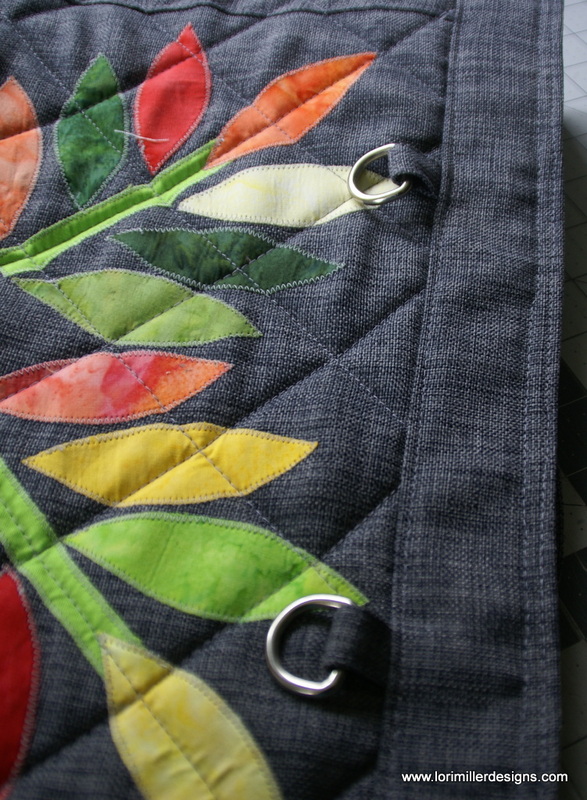 You may need to use some stabilizer underneath the design as you stitch so that the background fabric does not pucker. Use a light tear away or other stabilizer of your choice. I used a zig zag stitch that was a little bit larger than a satin stitch. For the points, I taper the stitch down before I turn. Next assemble all of the strips to create the pillow top. Layer pillow top with the muslin, batting and pillow top, right side up. Quilt as desired. I used painters tape to mark diagonal lines and then I quilted straight lines diagonally. Trim the pillow top to 16 1/2″ x 28 1/2″. It might be slightly smaller depending on how much quilting you did. 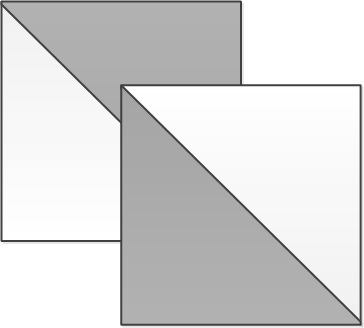 Fold each 18 ” x 33″ background print rectangle in half, wrong sides together, to form two 18″ x 16 1/2″ rectangles. Press. 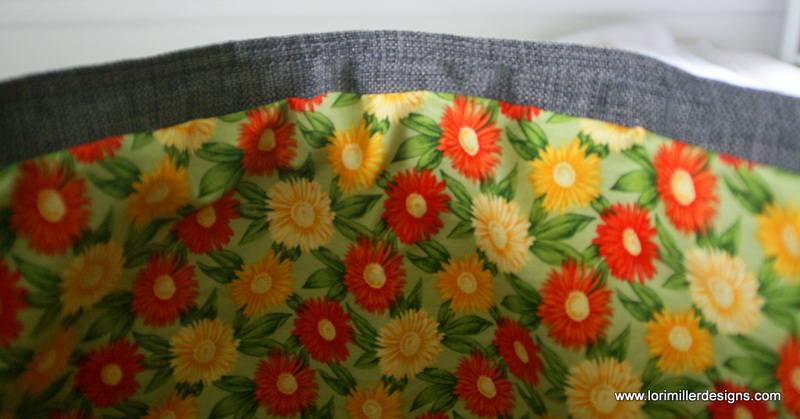 Top stitch along the folded edge of the pillow about 1/2″ away from the fold. Place the quilted pillow top, right side down. 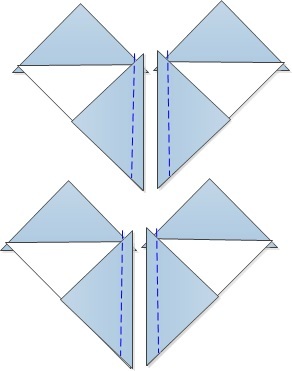 Place two folded rectangles over each pillow, overlapping the folded edges in the center by about 4″. Baste 1/8″ along the outside of the layers. Trim. Don’t you love this cute print that matches the applique so perfectly? I found it in my stash. Bind with the red binding strips. Finish by inserting a pillow form through the opening. 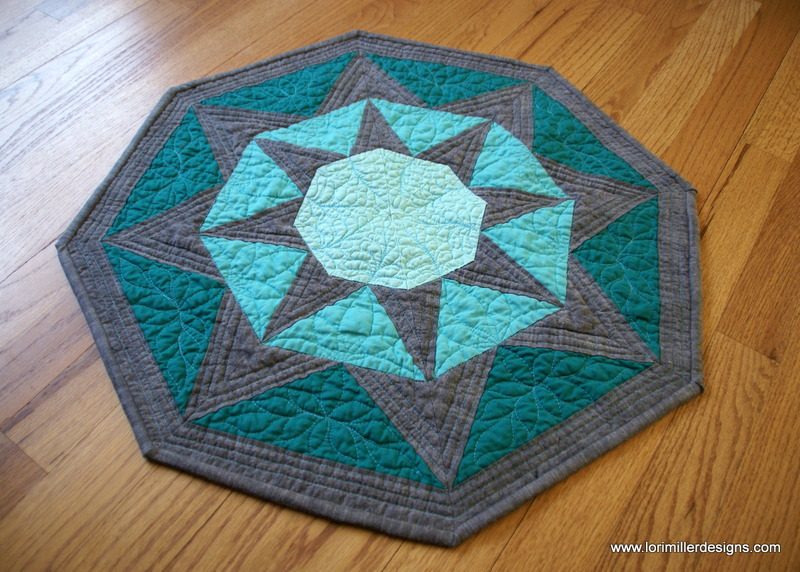 This fun Octagon shaped Stardrop Table Topper was designed with EQ8 Quilt Design Software by The Electric Quilt Company . This tutorial takes that design and gives you the information to make it yourself. 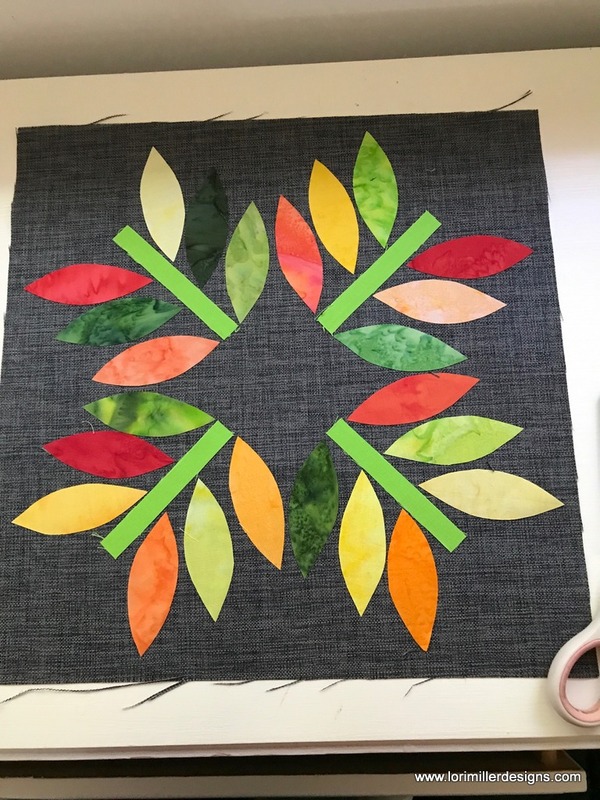 This is a very easy beginner foundation pieced mini quilt but it is helpful to have some basic knowledge of paper piecing. 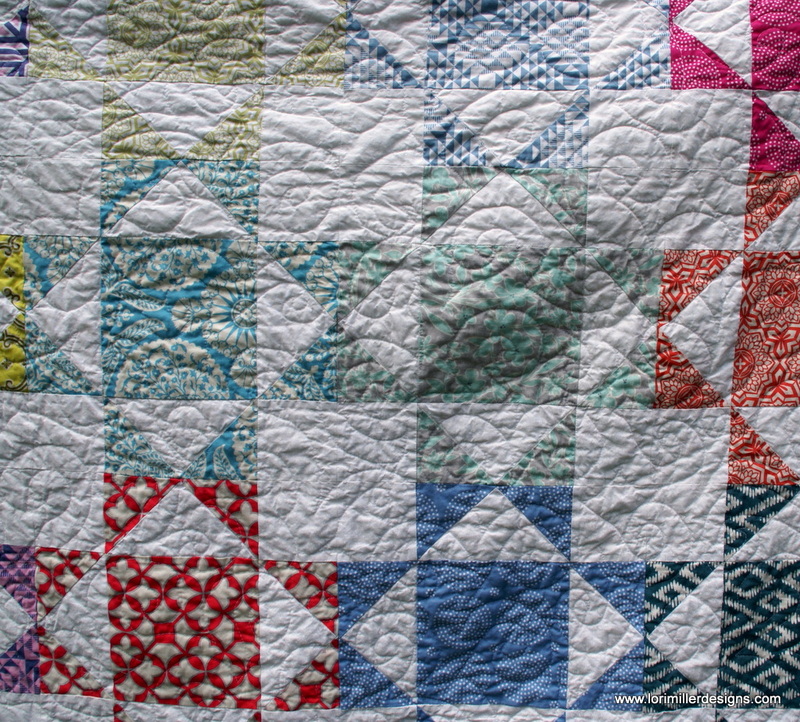 you will assemble eight units to combine to create the top of this little quilt. I made this with gradations of aqua and teal solid cotton fabrics and the background is a lovely linen. This is the perfect base for your table centerpiece. 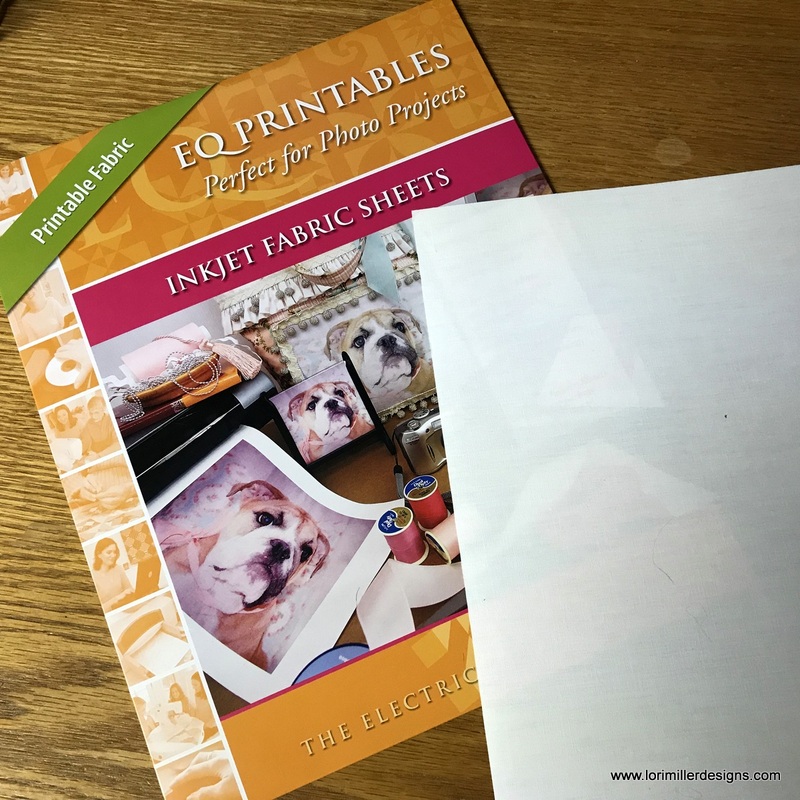 HINT: Have you tried printing on EQ Printables Foundation Sheets? 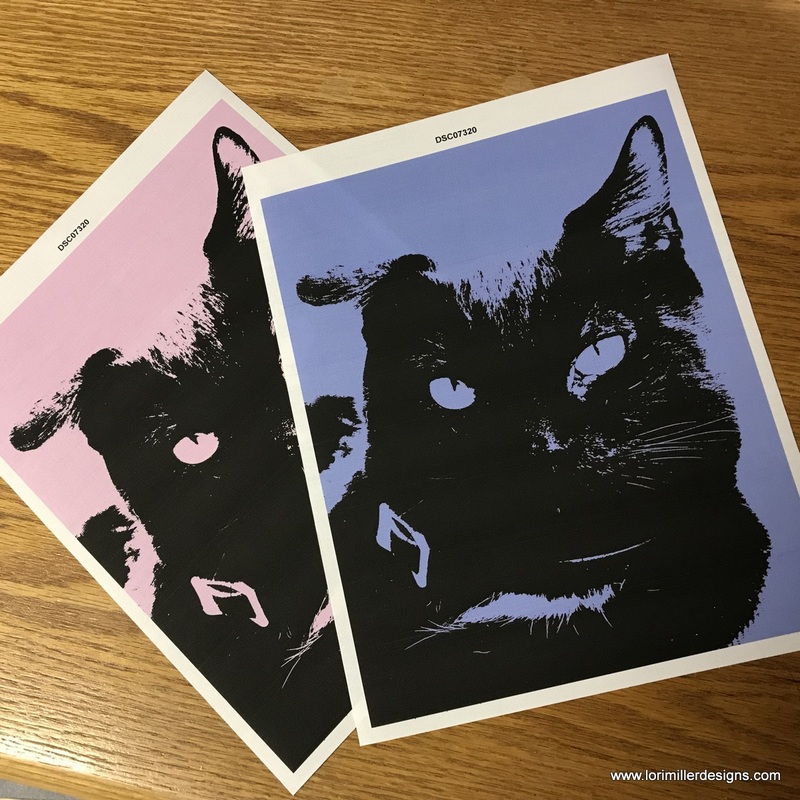 EQ has 25 sheet packages of special nonwoven material that you can run through your printer just like paper. It tears away easily, is translucent and won’t dull machine needles. If you don’t want to print, you can also use a pen, pencil or marker to draw your template onto the paper. Electric Quilt generously provided the foundation sheets for this project. 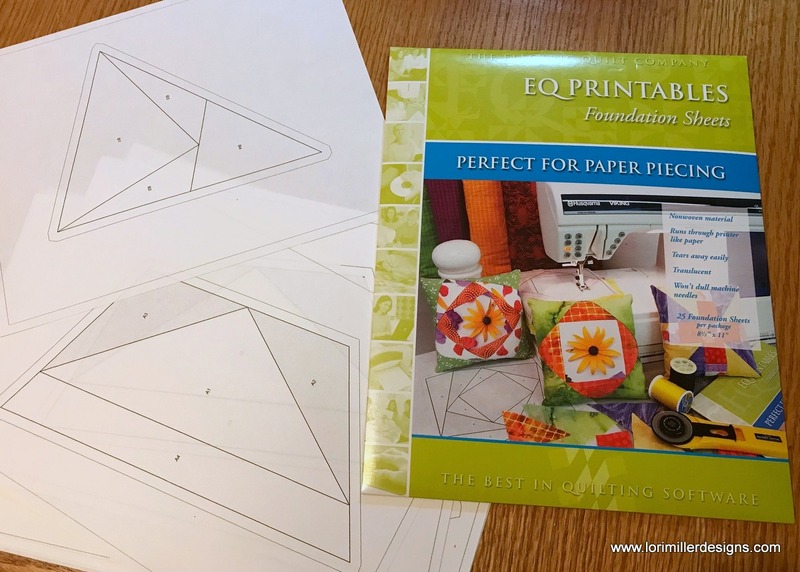 Use a pencil to trace the foundation pattern once onto EQ Printables Foundation sheets or other lightweight copy or foundation piecing paper of your choice. 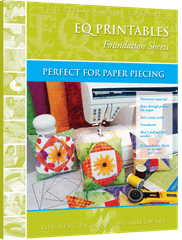 You can also print a copy of the foundation pattern onto lightweight copy or foundation piecing paper. 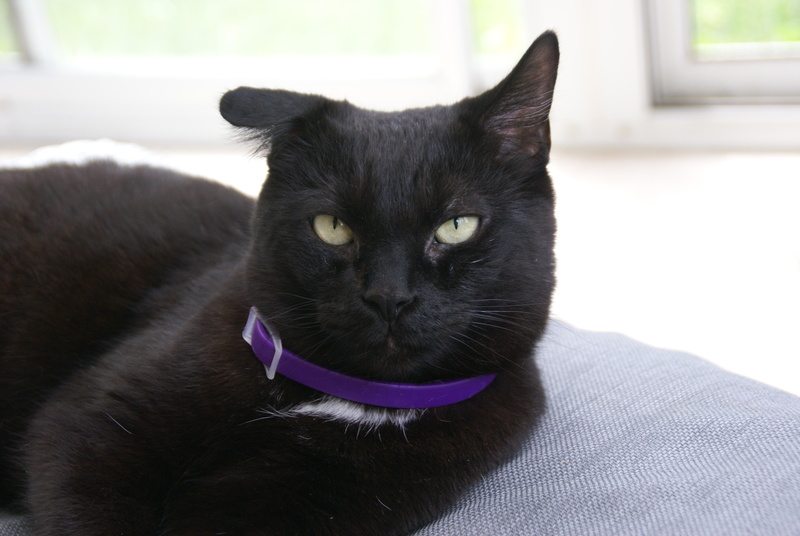 EQ generously provided the foundation sheets for this project. The sheets feel like a soft stabilizer, they easily went through my inkjet printer. I like that you can see through them so it is easy to match up fabrics from the backside. It is super easy to sew through and it is not as stiff as paper. Use a very short machine stitch, I use 1.8 mm so the paper will tear off easily later. 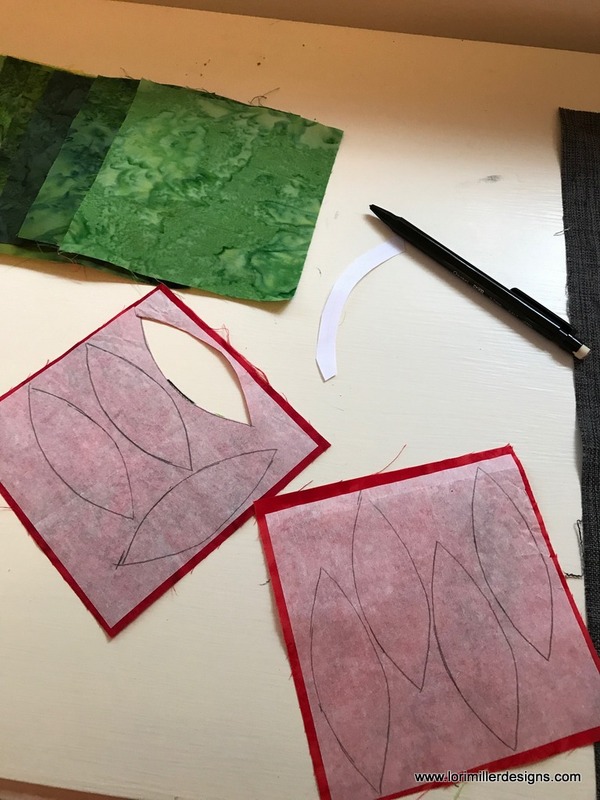 To foundation paper piece, stitch fabric pieces to a foundation paper with the marked side of the paper facing up and the fabric pieces layered underneath. 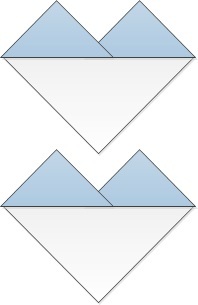 The resulting pieced unit is a mirror image of the foundation paper. 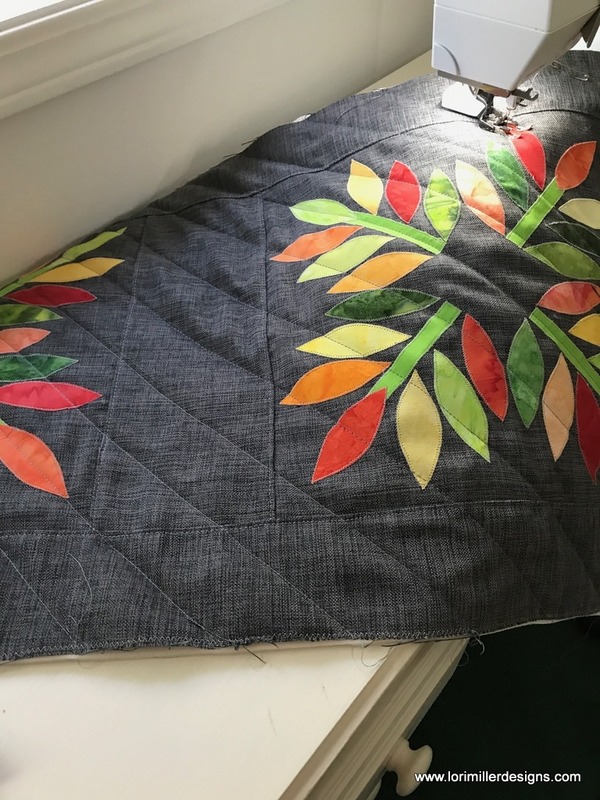 Using the larger template and starting in the number order, place the first two fabric pieces, RST, on the back side of the foundation paper with the edges of the fabrics extending ¼” beyond the first stitching line. 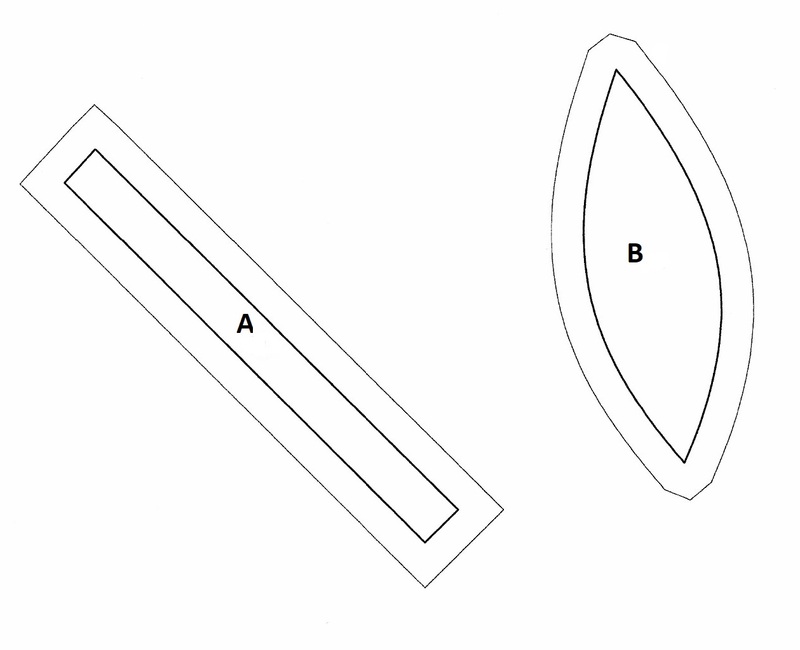 The first stitching line is between section A1 and A2. Holding the pieces in place, stitch from the top side on the line between the two areas, starting and stopping just past the seam allowances. Above, you see the back side of the pieces we just stitched. 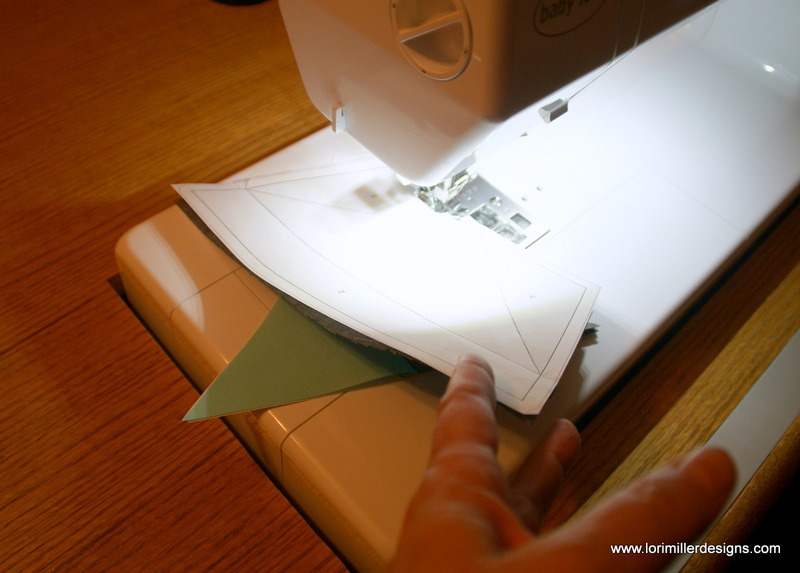 Flip the piece back over and fold the paper back on the line you just sewed. 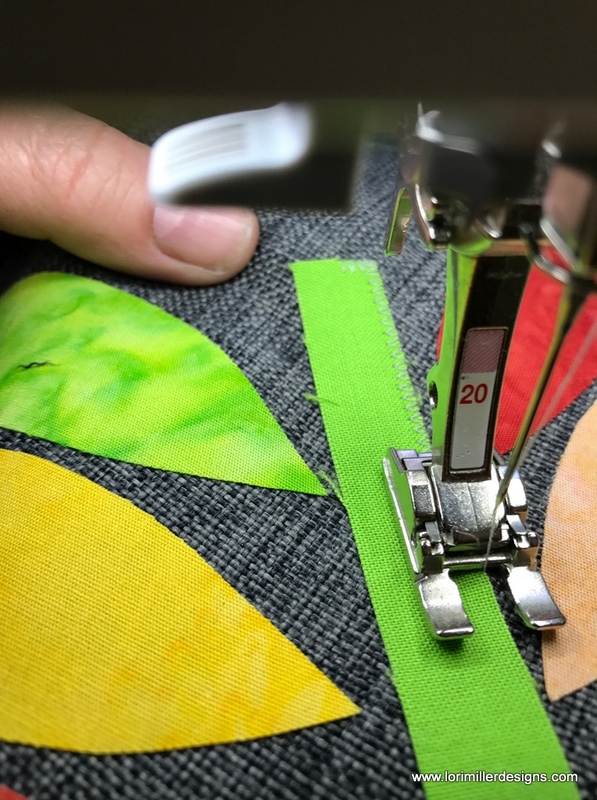 Using a ruler, trim the seam to 1/4″. Be careful not to cut through your paper template. Fold the paper back and flip it over again. Open out the piece and press the seam. 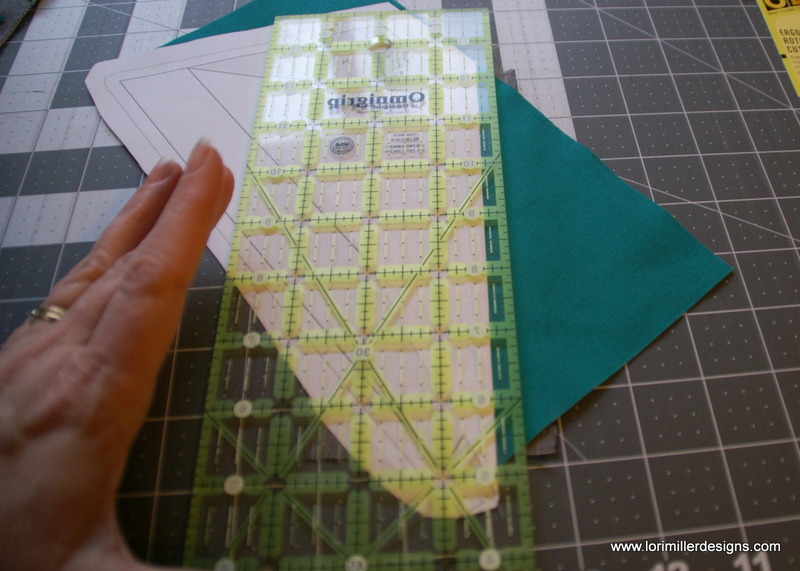 The right sides of the fabrics will show on the back side of the paper template. 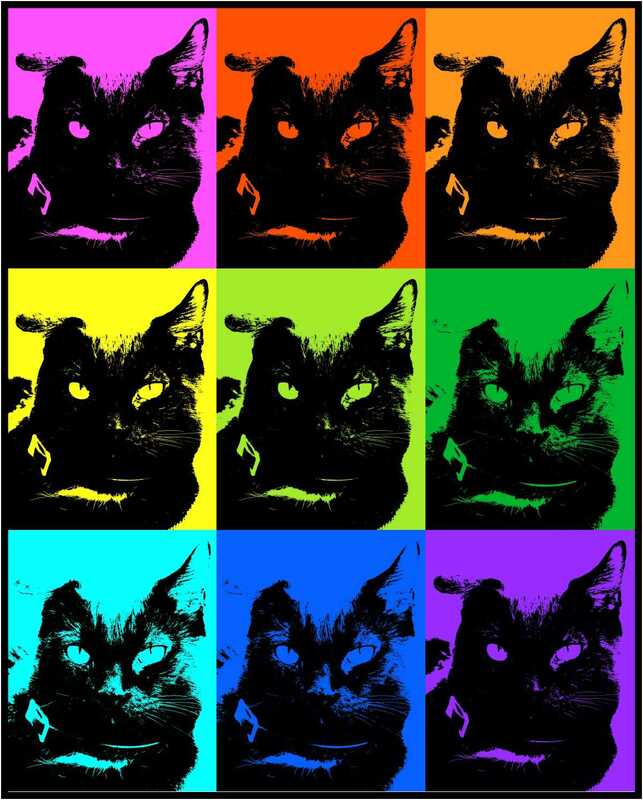 Continue to add pieces in order step by step until you have finished the bottom template. 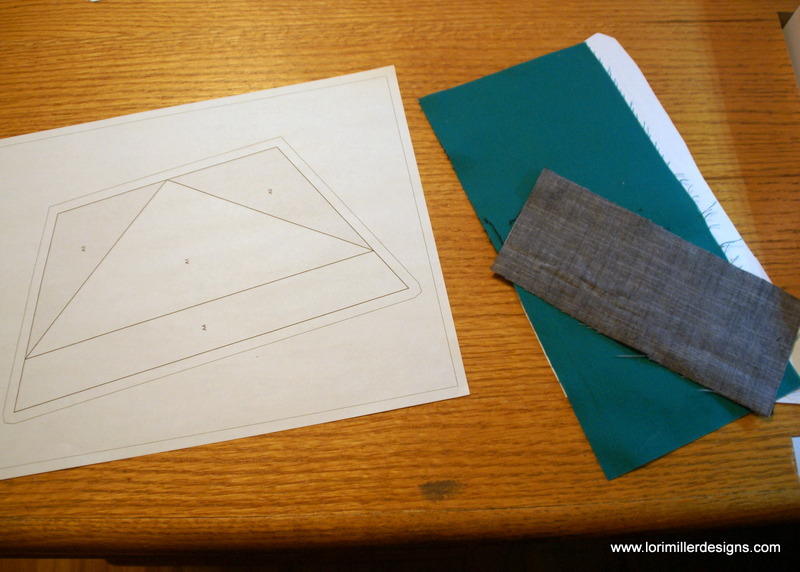 Trim the bottom template around the outside seam allowance on the paper. 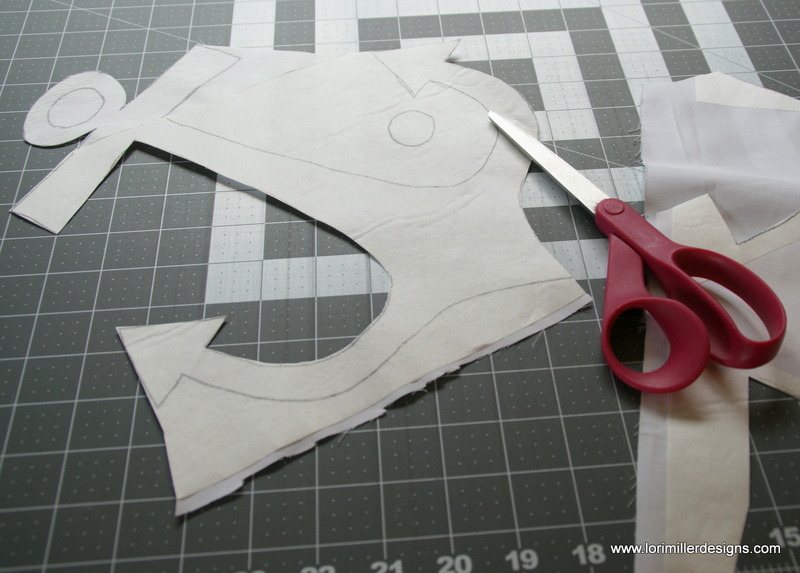 Use the same method to sew the top template pieces. 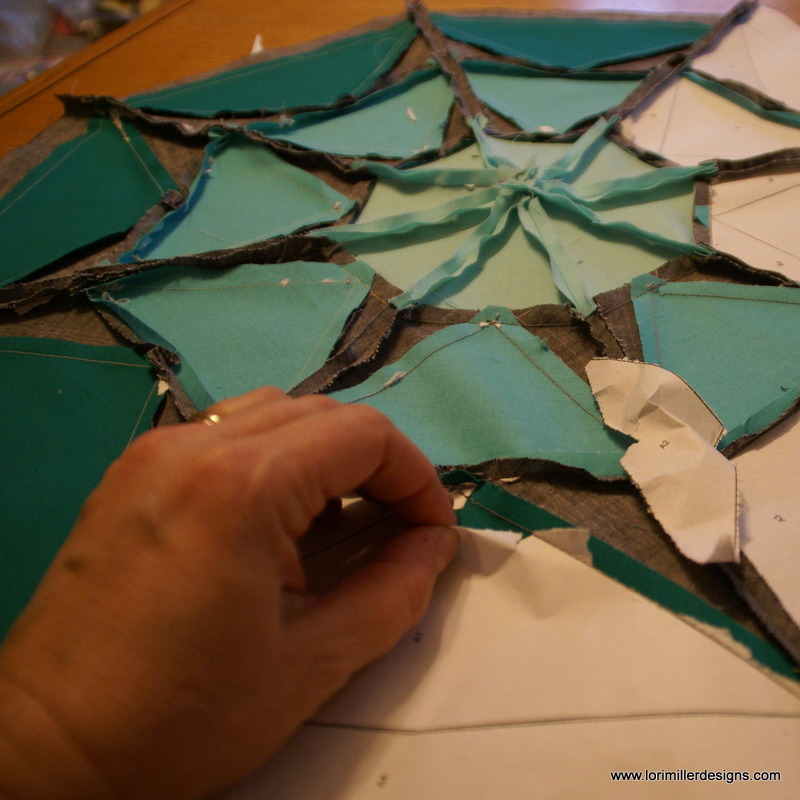 Carefully sew the top and bottom foundation templates together. 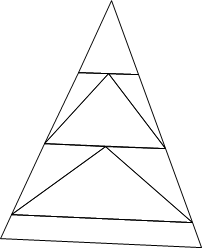 You should have a total of 8 triangle shapes. 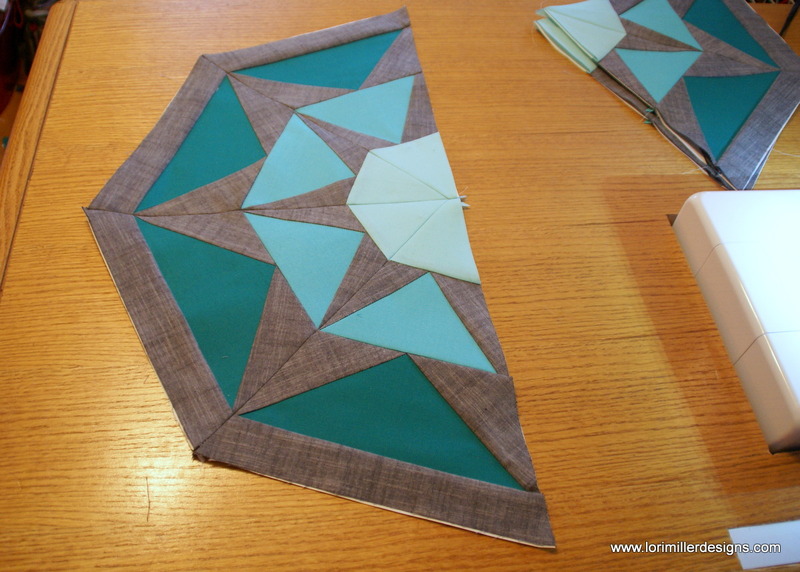 Sew together the paper pieced shapes, two at a time, aligning seams and points. Then stitch together the pieces to form two halves. Now you can sew together the two halves, aligning the center points and seams. Make a quilt sandwich with the quilt top, batting and backing. Baste the quilt layers together. Quilt as desired. I used some free motion feathers and leafy motifs in the triangles. 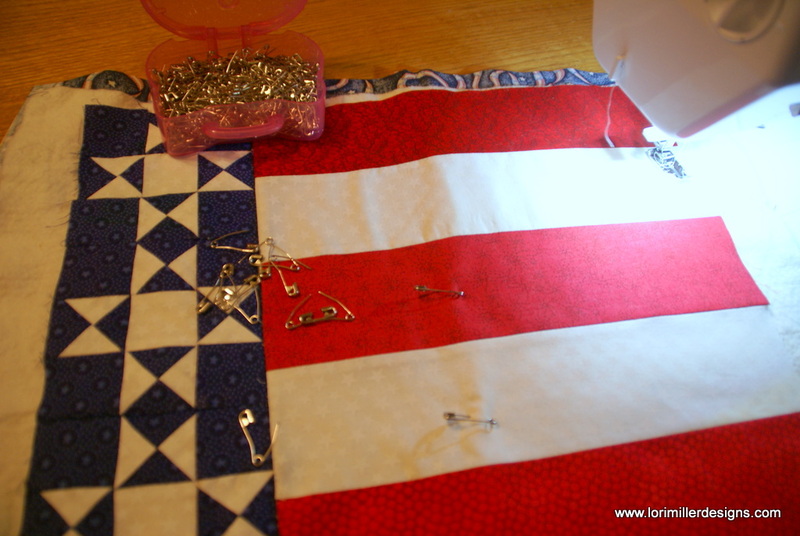 Sew the 2 1/4″ strips together for the binding and add to the quilt. You are finished! 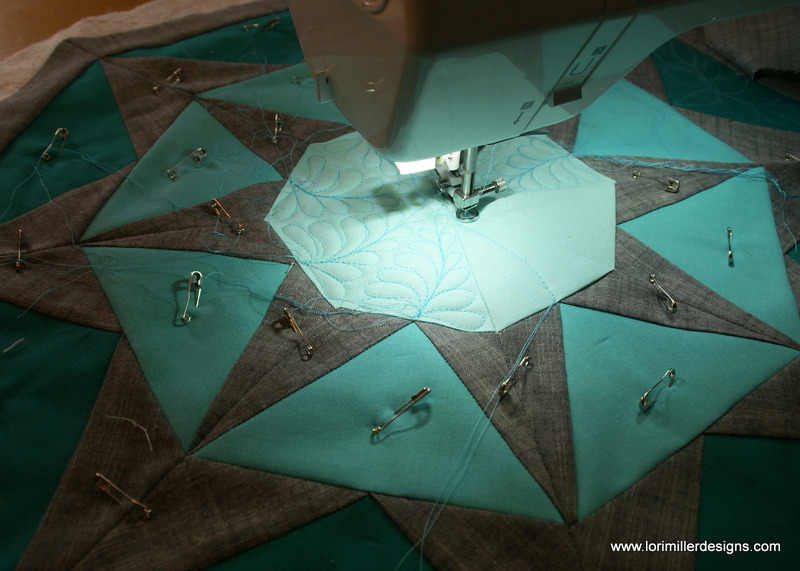 I would love to see your Stardrop Table Topper Quilt, tag me on instagram @lorimillerdesigns. 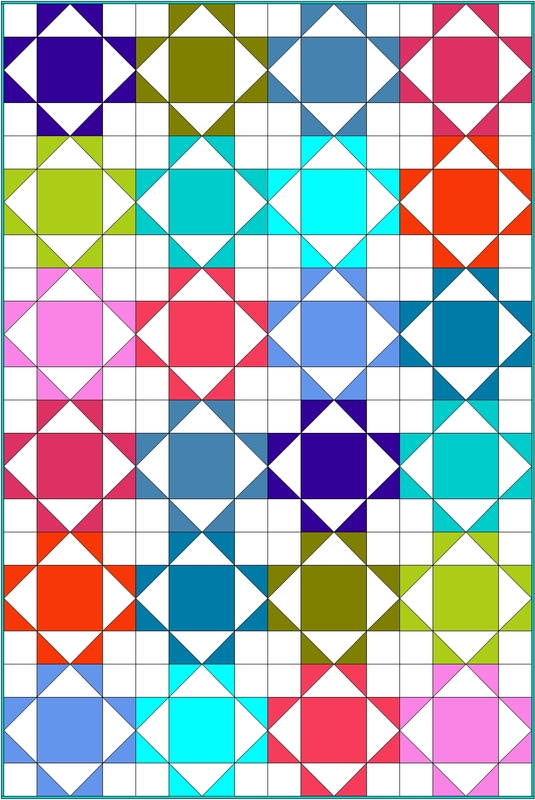 Lets have a party before summer ends with this fun and cheery Fiesta Quilt! 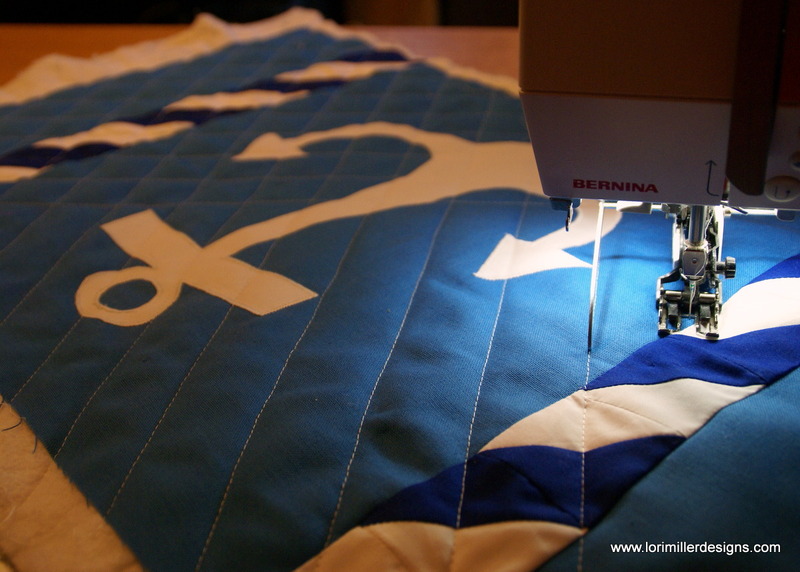 My next tutorial is a quilt designed with EQ Software by The Electric Quilt Company . It uses a simple Horizontal layout with only one block. The large 12 inch block shows off some lovely Joel Dewberry prints that I picked up from Crimson Tate at Quiltcon this year. 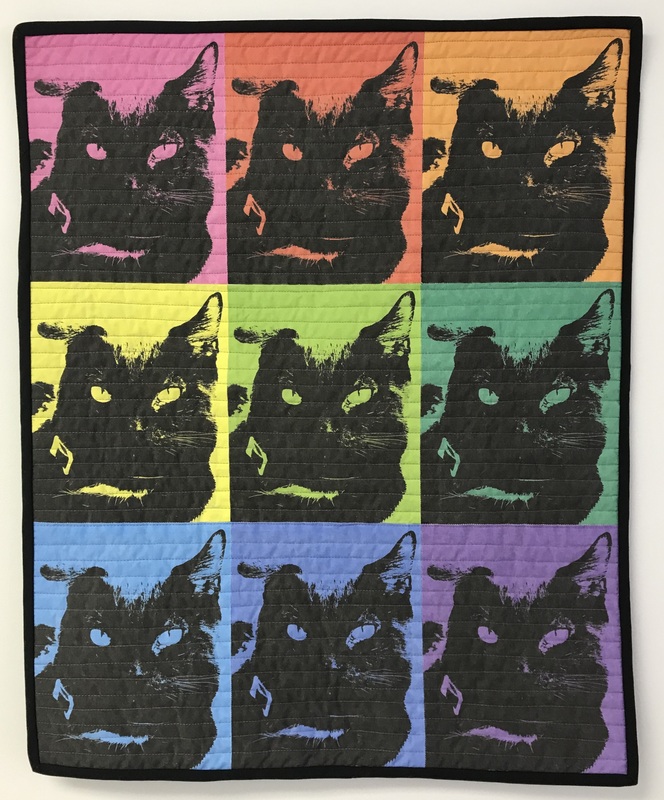 If you have a stack of fat quarters that you have been wanting to use, this quilt makes two blocks from each fat quarter with a single background color. 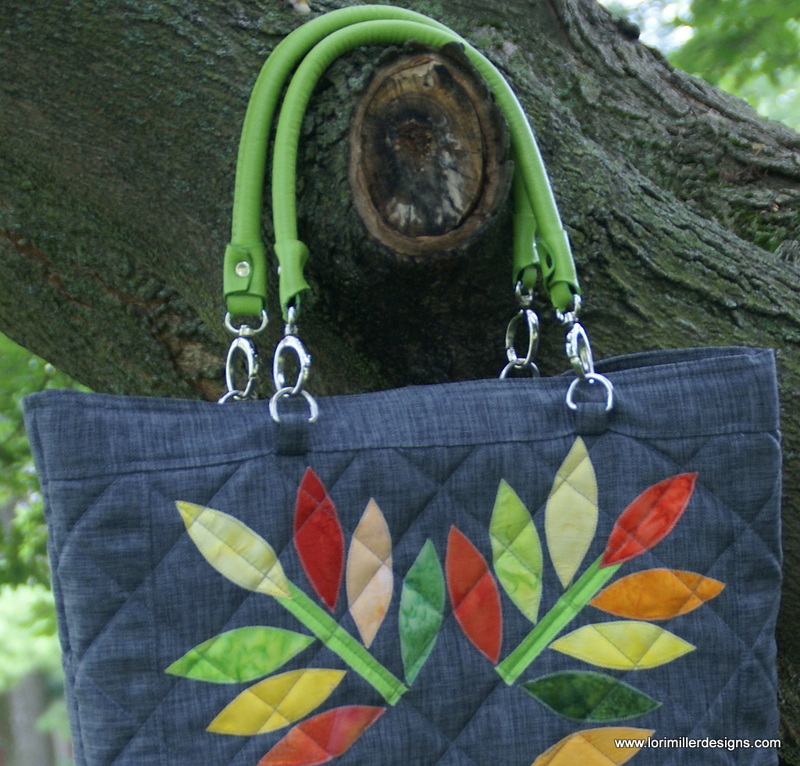 All of the varied colors give a scrappy look, so you could certainly use whatever fun fabrics you have on hand. 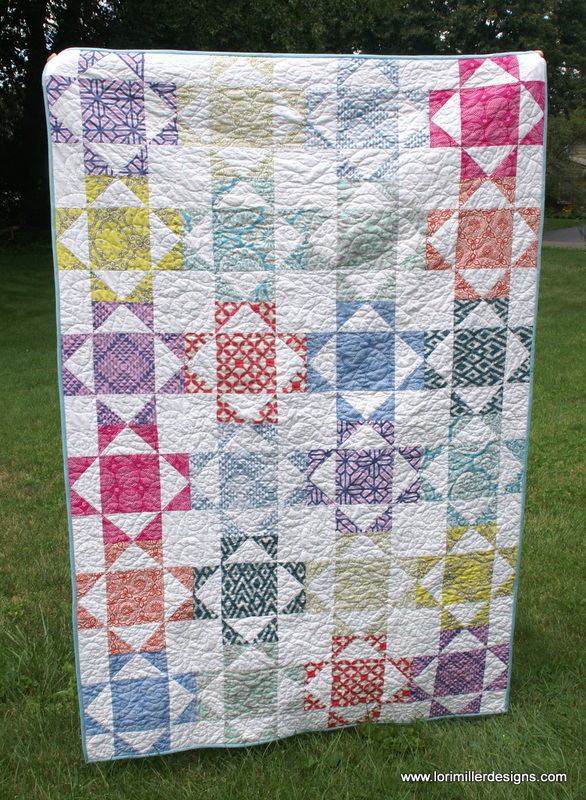 When I designed this little quilt, I used a simple horizontal layout using just one block called the Economy Block. I wanted a large block to show off the fabric prints that I had so I made the blocks 12 inches square. 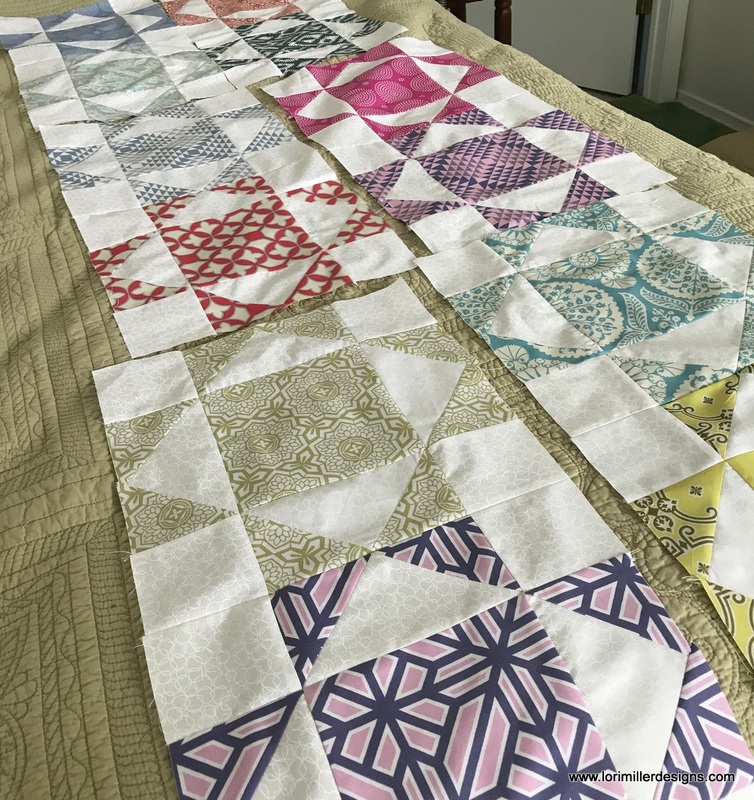 It worked out that I could get two blocks made from each fat quarter with a little to spare. I kept playing with the sizes of the blocks in the software to try and use as much of a fat quarter as I could. 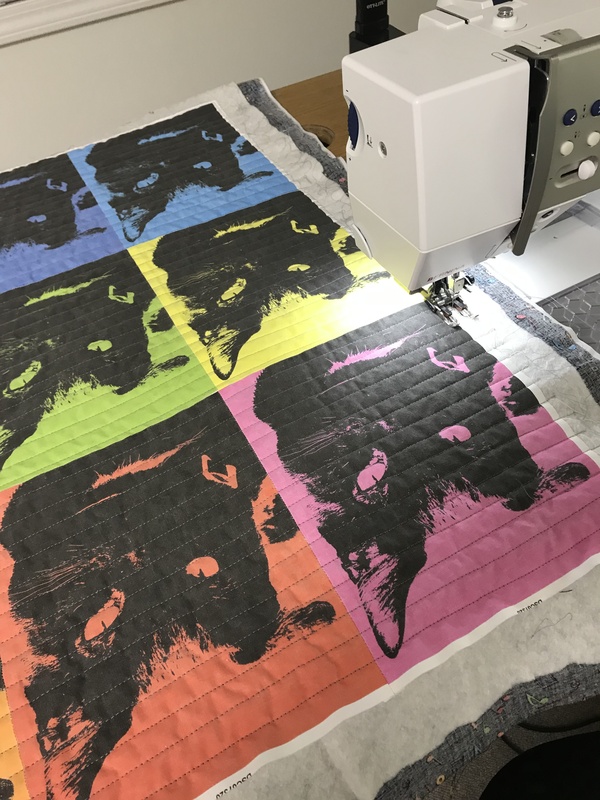 The software lets you print how much fabric is required for a block so you can play with the sizes until it matches what fabric you have on hand. 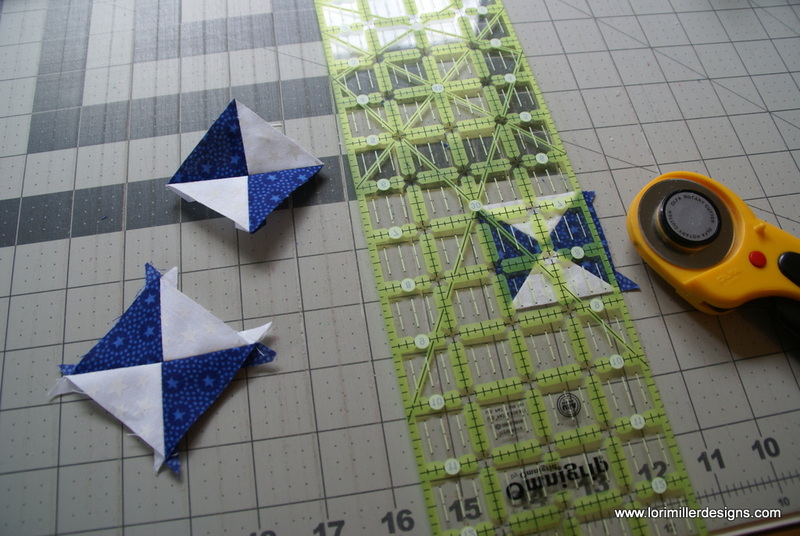 This block contains 4 flying geese components and there is a great way to make 4 matching flying geese. 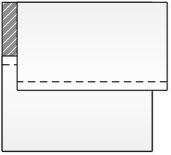 On the back side of each 3 7/8″ print square, mark a line diagonally through the center of opposite corners. 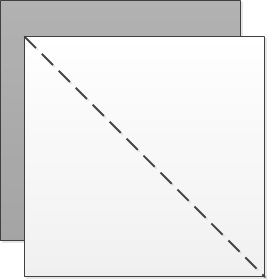 Place two print squares diagonally, right sides together (RST) over one of the 7 1/4″ white background squares. The print squares will slightly overlap. Stitch 1/4″ away from each side of the marked center line. Carefully cut between the two lines of stitching. Press towards the small print squares. 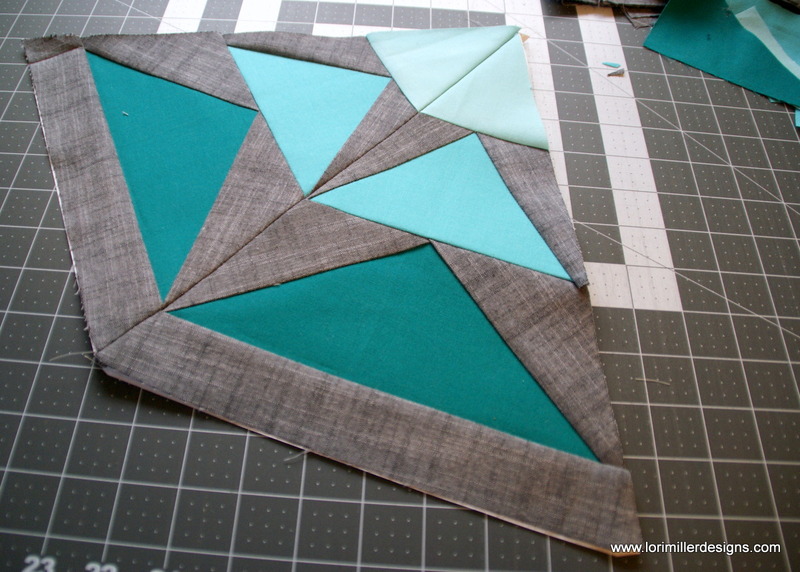 Place two 3 7/8″ print squares, RST, over the two triangle units. Stitch 1/4″ away from each side of the marked center line. Press towards the small print squares. You will have 4 identical flying geese. Once the geese are assembled, layout all of the pieces of the block. Trim the blocks carefully to 12 1/2″ x 12 1/2″ square. Layout your blocks in a pleasing arrangement. 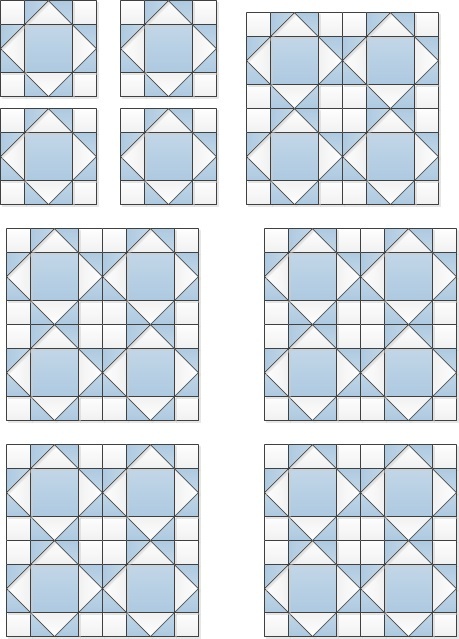 You have two of each block but you can randomly lay them out. I used this fancy design wall, ok, well it is really my bed up at the cottage. I sewed them in group of four and then put them all together. Piece together the backing so that it is about 4 inches larger than the quilt top all around. Quilt as desired. I used an all over swirly pattern. 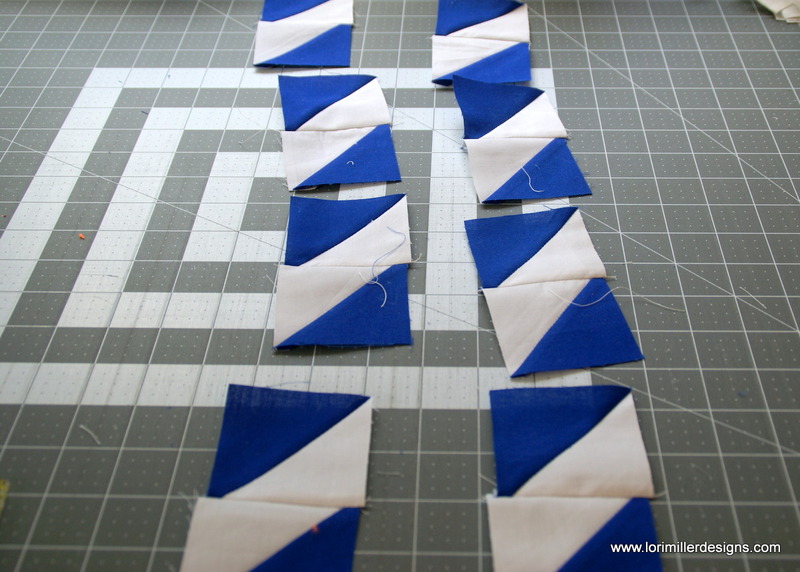 Sew the 2 1/4″ strips together for the binding and add to the quilt. You are finished! Time to Fiesta! 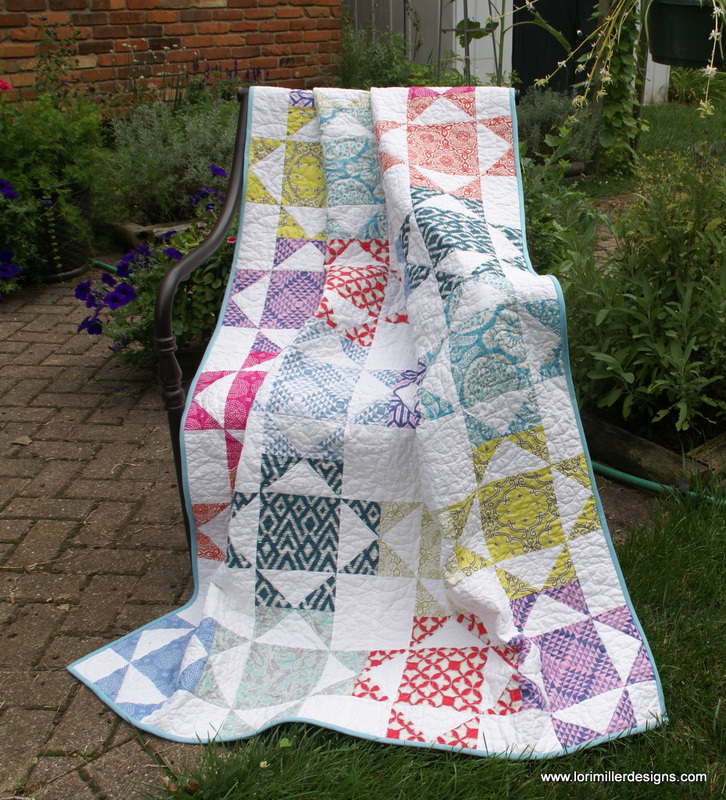 Use that fat quarter bundle from your stash or cut up some colorful scraps for this quilt. I would love to see your Fiesta Quilt, tag me on instagram @lorimillerdesigns. Looking for the EQ Mini Design Instructions? You can find them HERE! For this month’s free tutorial project, we are sticking with a mini approach. 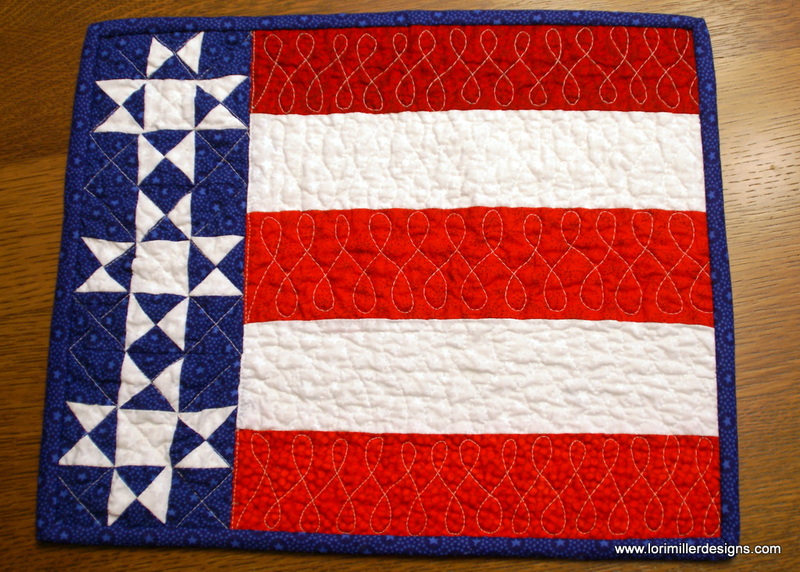 This striking design is for a patriotic placemat which certainly qualifies as a mini quilt. 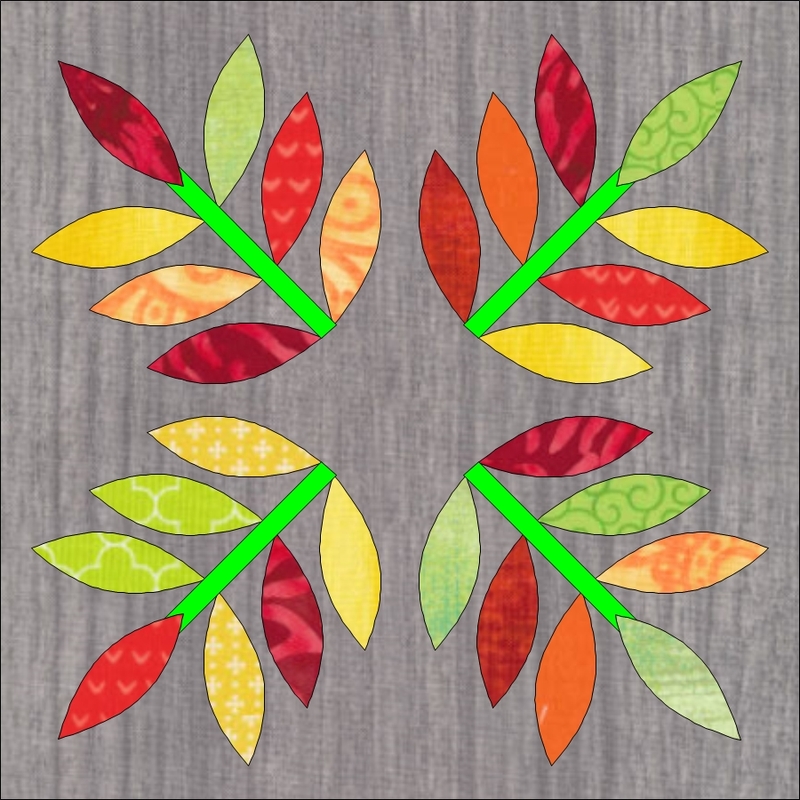 This placemat was designed with EQ Mini Software by The Electric Quilt Company . 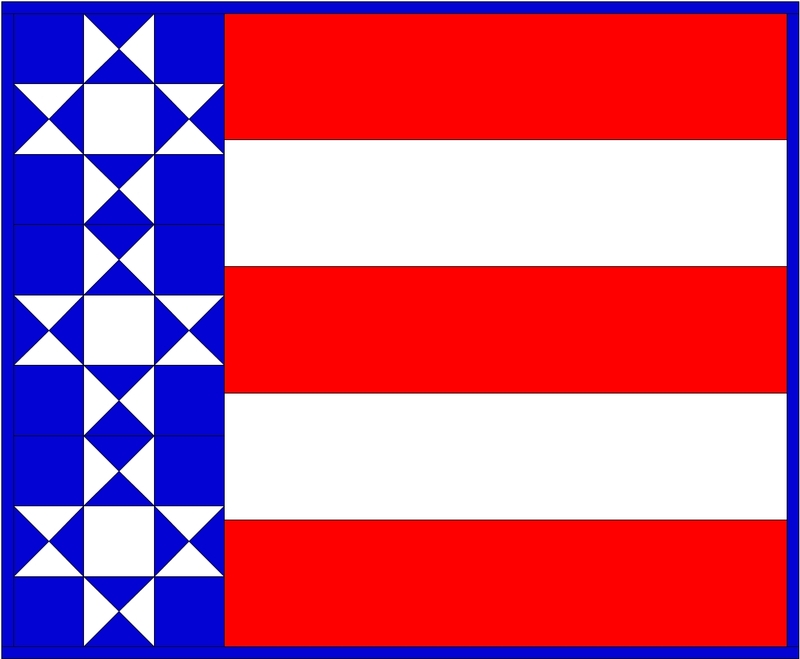 It uses a Vertical strip layout and a traditional Ohio Star block to create a winning red, white and blue design. Stitch up as many as you need for your holiday celebrations or just make one for a cute centerpiece design. 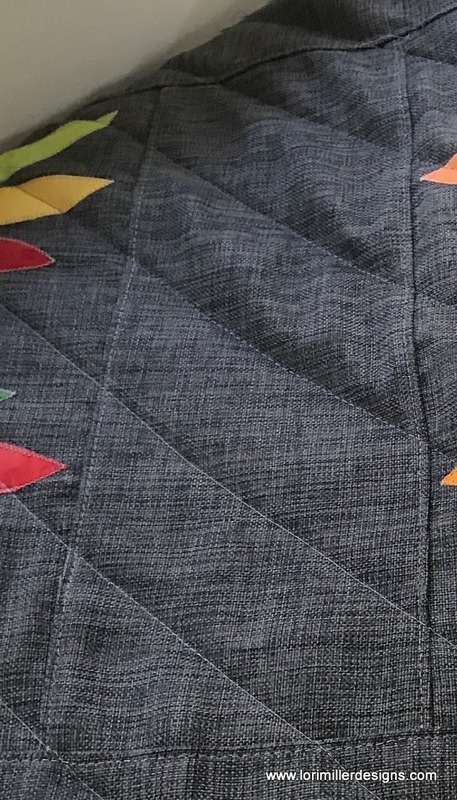 When I designed this little quilt, I used a vertical strip layout with two strips. Each strip uses a pieced row of blocks. Finished size is 14″ x 17″. This will make one placemat. 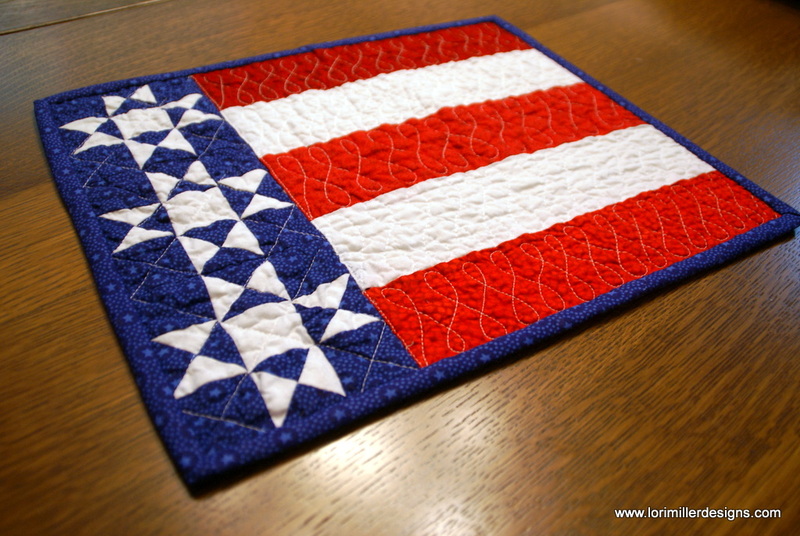 You will make three Ohio Star blocks for each Americana Placemat. Start with quarter square triangle units. 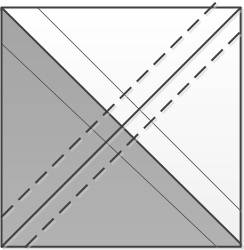 Mark a line on the wrong side of the 3″ white fabric squares diagonally from corner to corner. 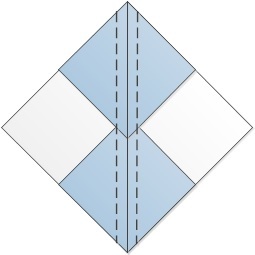 Place the marked white fabric square right sides together (RST) with a 3″ blue fabric square. 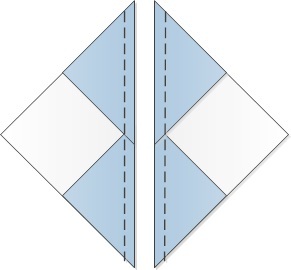 Sew two seams, each 1/4″ away from the center marked diagonal line. 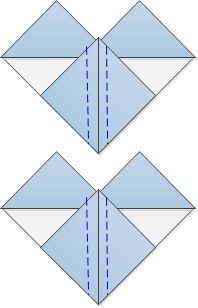 Cut along the marked line to separate the half square triangles. Press seams to the darker fabric. 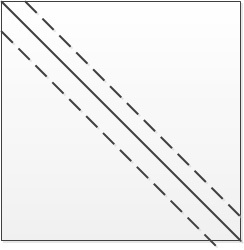 Mark a line on the wrong side of one of the half square triangles. Pair the half square triangles, RST. with opposite fabrics facing each other. 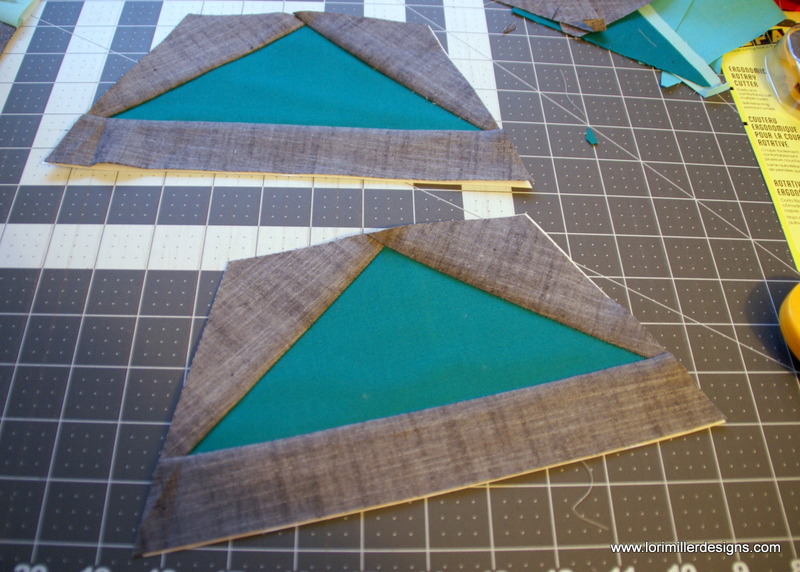 Cut along the marked line to separate the now quarter square triangles. Press seams open. 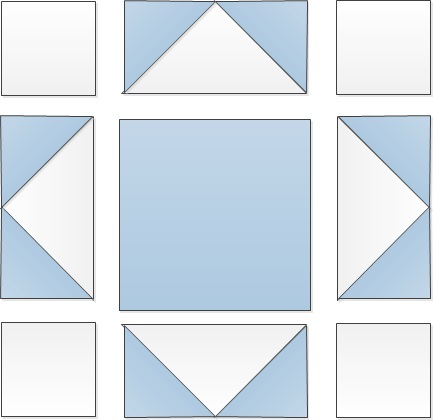 Make a total of 12 quarter square triangles. 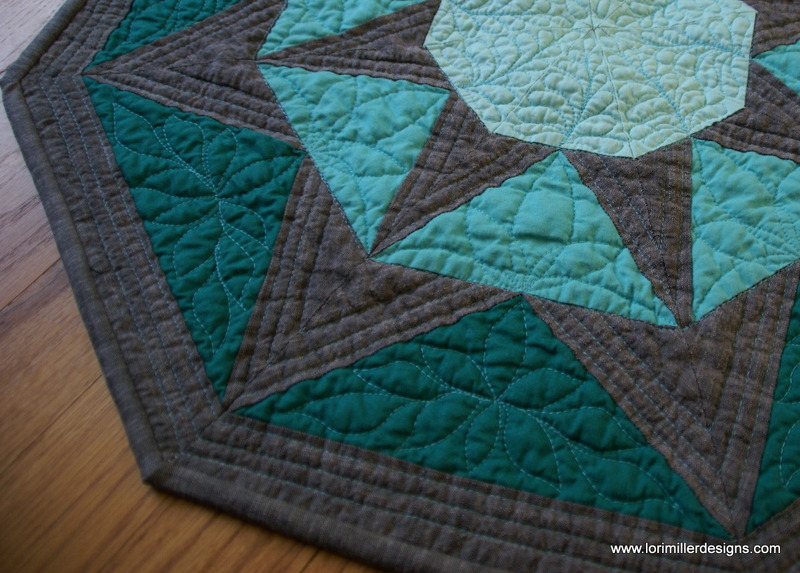 Trim the quarter square triangles to 2″ square. 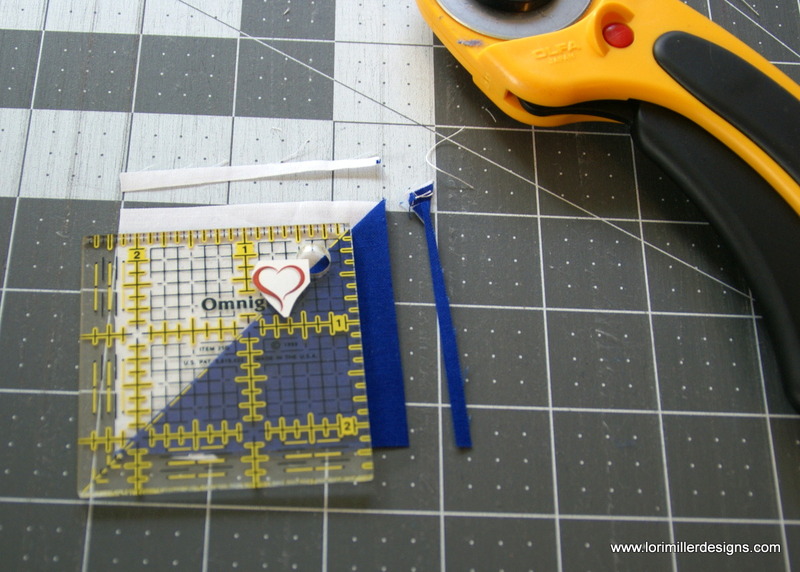 Arrange the parts of the Ohio Square block and stitch together. Sew the three stars together for the left side of the placemat. Sew the red and white strips together for the right side of the placemat and then join them together. Note: I rounded up some of the numbers to 1/4 inches so you may have to adjust a bit to match up the stars with the stripes. I did not want you to have to work with sixteenths of inches. Make a quilt sandwich with the backing face down, then the batting, then your quilt top face up. Quilt as desired. I stitched some fun loops in the red and white strips. 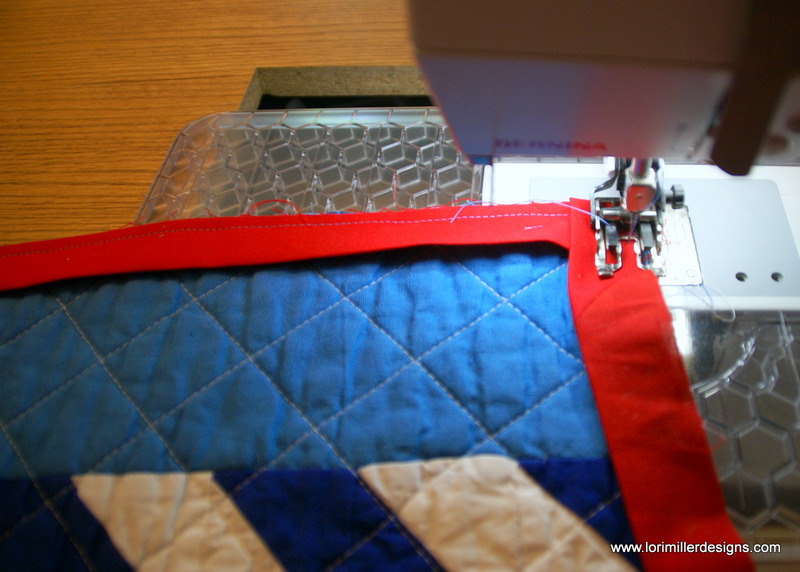 Sew the 2 1/4″ binding strips together and add to the quilt. Finish the binding and you are done! This is a fun placemat to make. Take your time with the Ohio stars so you can really line up the points. Share your pictures of the Americana placemat, tag me on instagram @lorimillerdesigns.